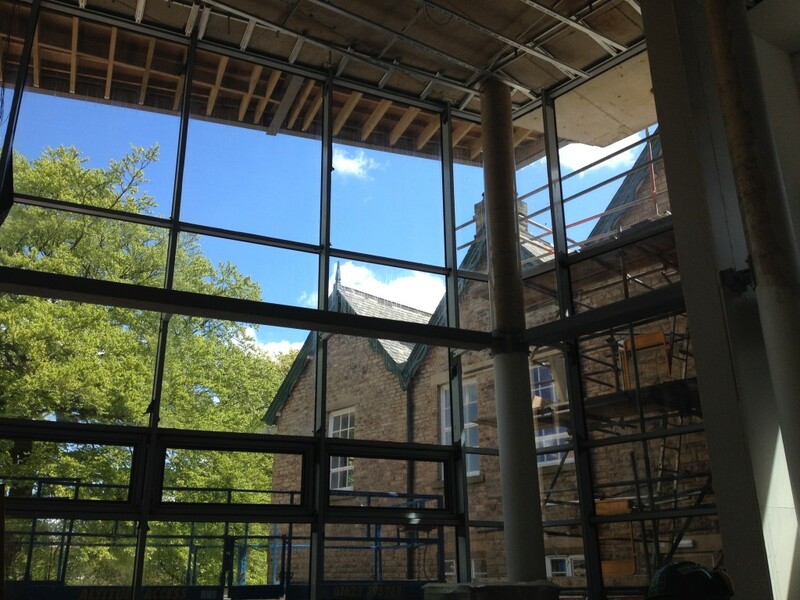 I made a site visit to the Heart of the Campus building along with Andrew Illingworth, Interior Designer for HLM Architects & Garry Farmer, Project Manager for Graham Construction, the main contractors on the project. 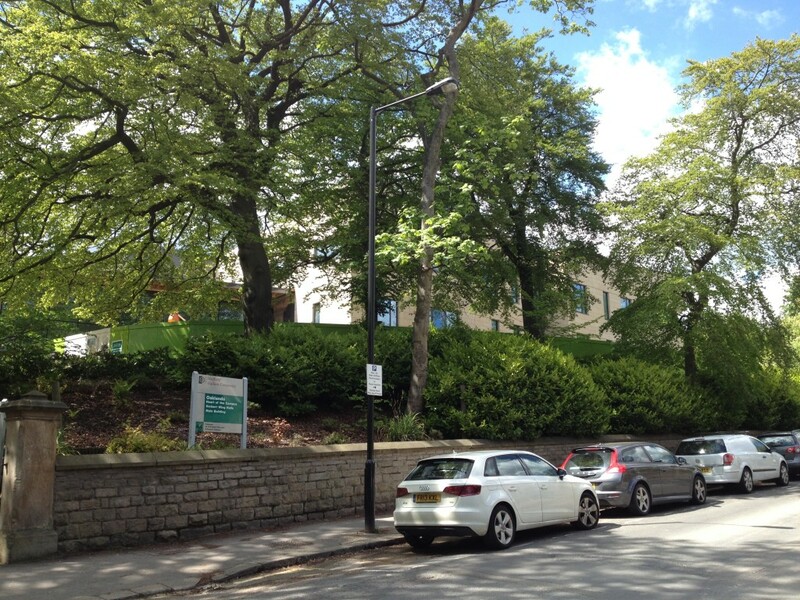 Seen from Collegiate Crescent, the building is just visible behind the mature Beech trees. Heart of the Campus building, just appearing behind the Beech trees on Collegiate Crescent. East Elevation stonework looking incredibly sharp in the sunlight. 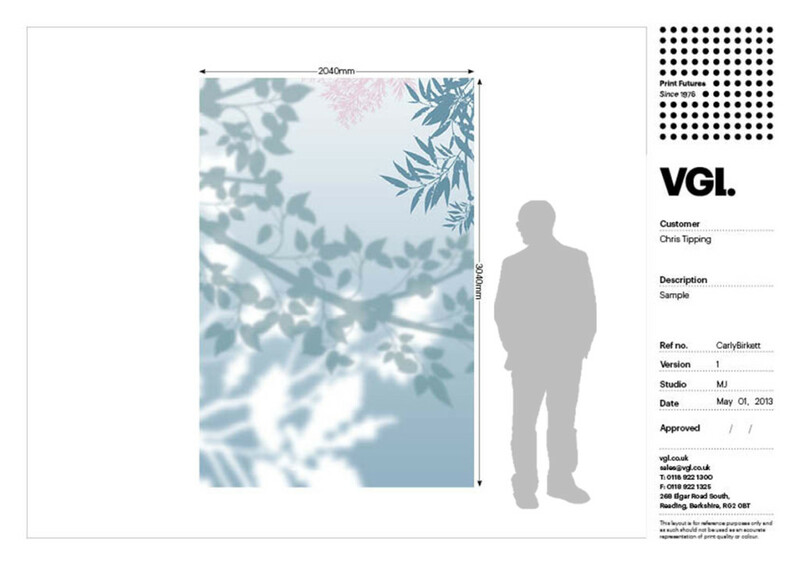 I have been commissioned to extend the original brief for a cnc routed Rockpanel rainscreen on the West Elevation to include digitally printed vinyl manifestations for the East Elevation glazed curtain wall and interiors. This was an incredibly useful visit as the building has really moved forward since my last time here in January this year. The interior atrium is three storeys high and filled with light. It is a dynamic architectural space which has as a centrepiece, a cantilevered cube projecting out from the first floor. 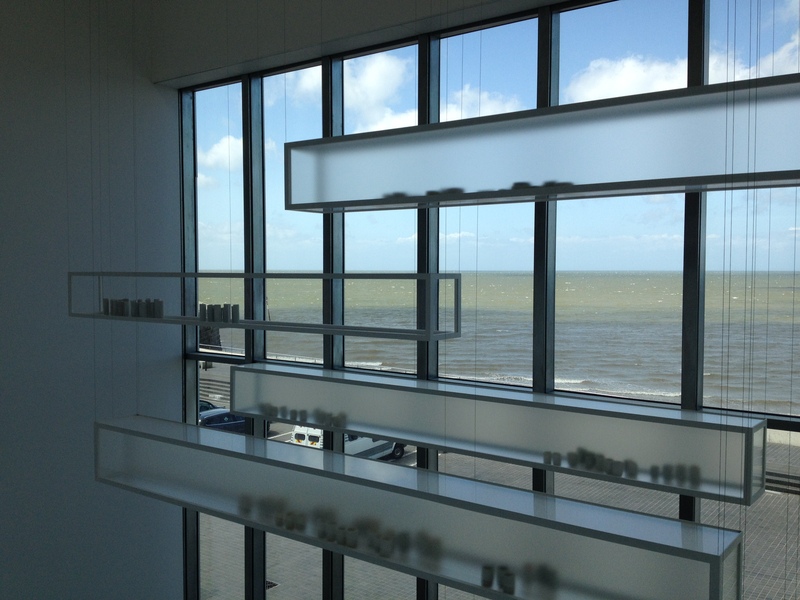 When sunlight floods in via the fully glazed atrium roof, the whole building is suffused with light and shadows. 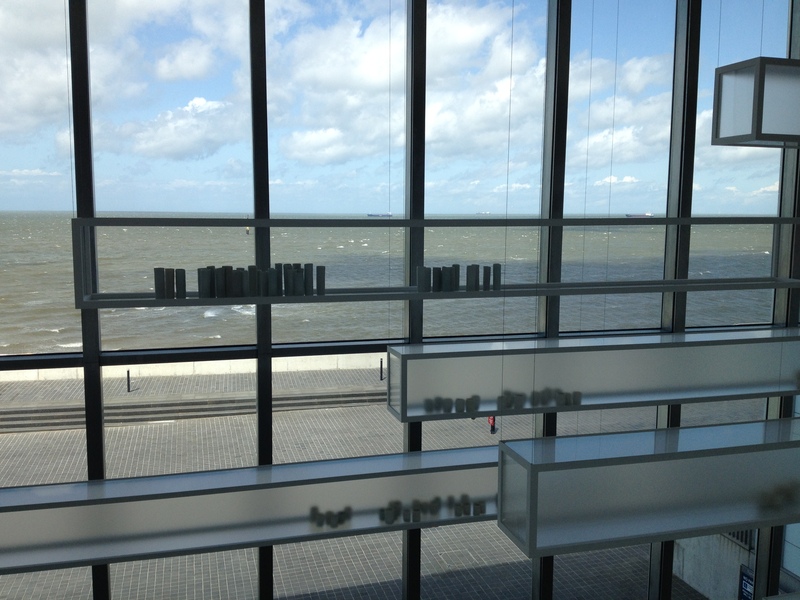 This is the view from inside the first floor cantilevered cube room. 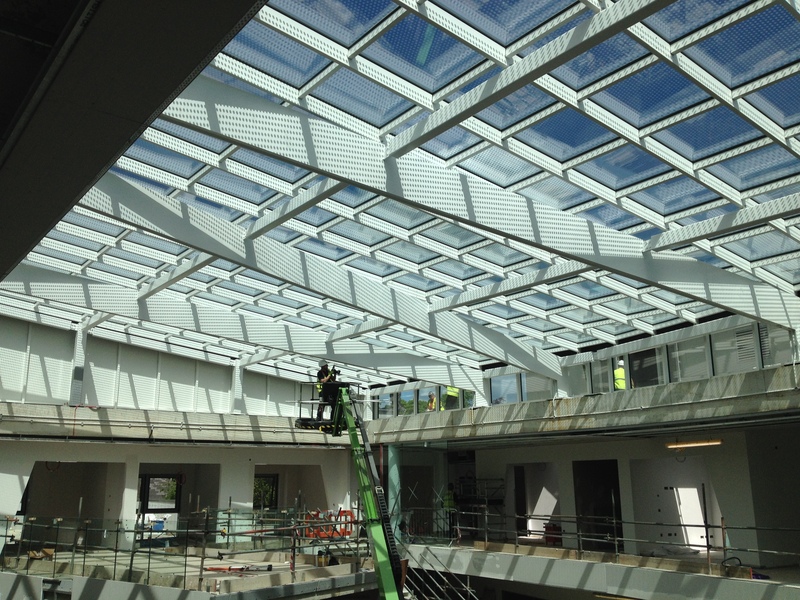 The atrium roof is fully glazed and when a break in the clouds fills the space with light and shadows, the effect is pretty wonderful. 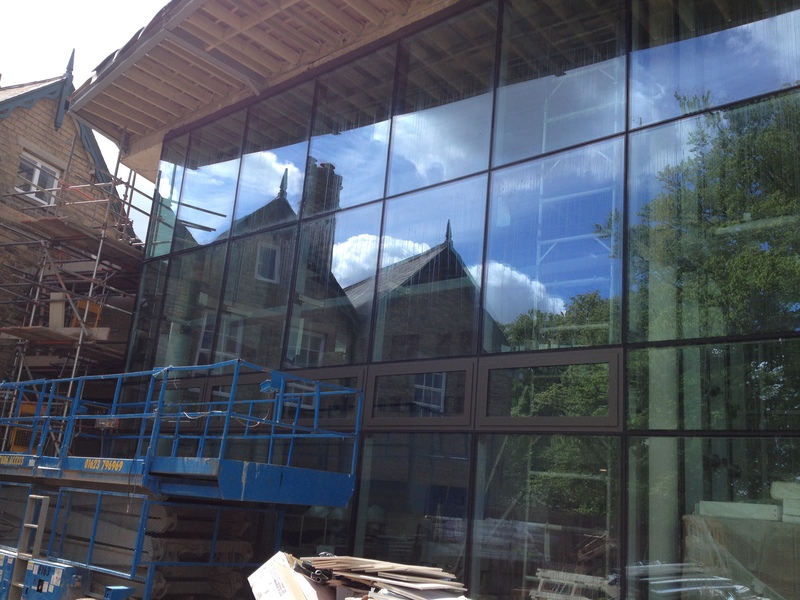 The interior of the main East Entrance to the building is a double height glazed curtain wall. 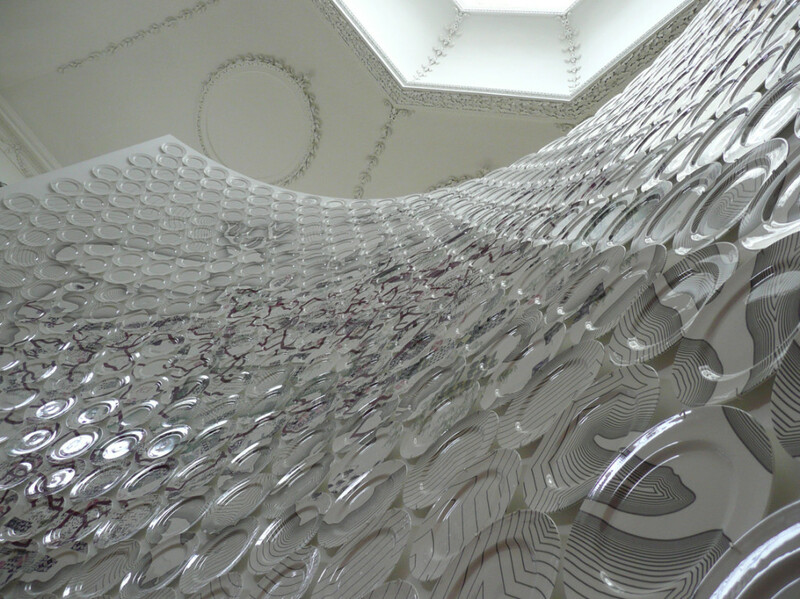 This is an amazing site for the artwork manifestation. This is a part of the external East Elevation entrance, with the double height glazed curtain wall. Whilst on site I couldn’t resist a quick look at the West Elevation Rockpanel ‘drawing’. 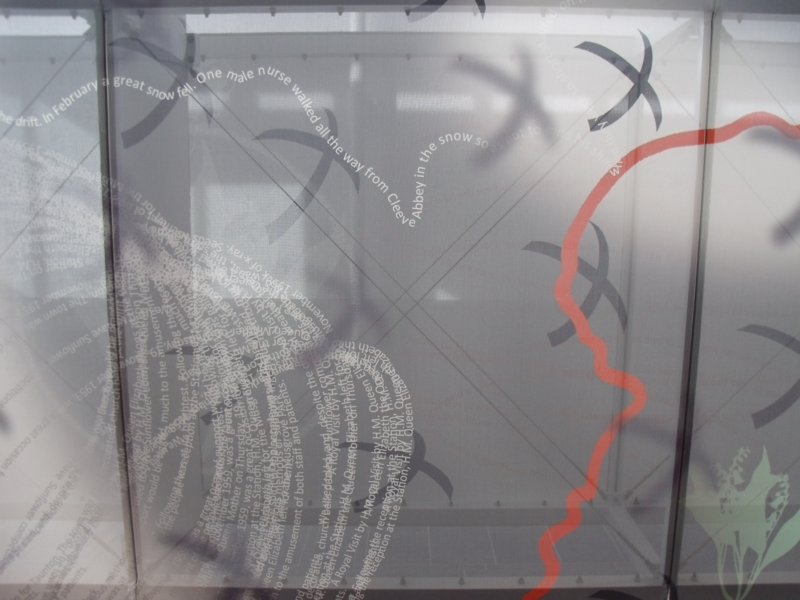 This artwork is cnc routed into the rain screen panels & was manufactured by The Cutting Room in Huntingdon. 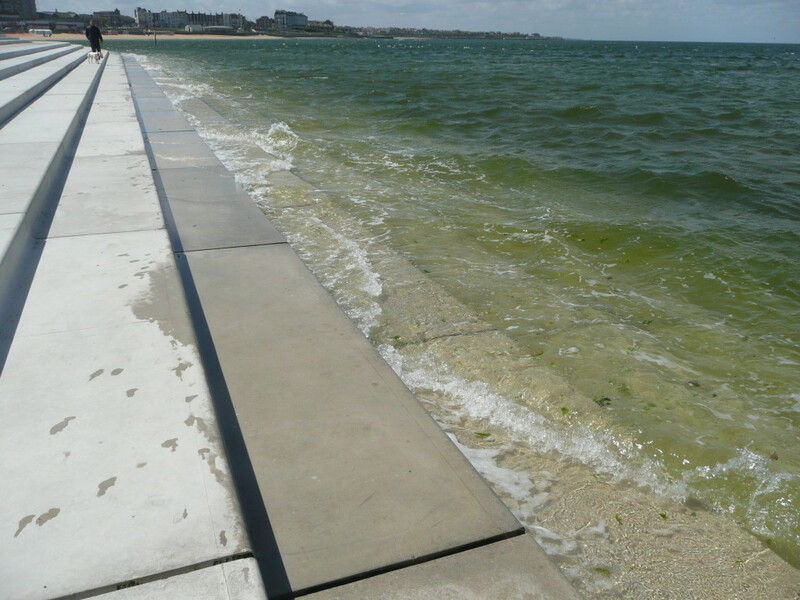 The exposed base material, almost a bright yellow colour when first exposed, darkens in contact with sunlight and has now achieved its permanent shade. This is more subtle then when first installed, & has now blended in with its architectural setting. Up close, the detail is crisp and casts strong shadows on a sunny day. 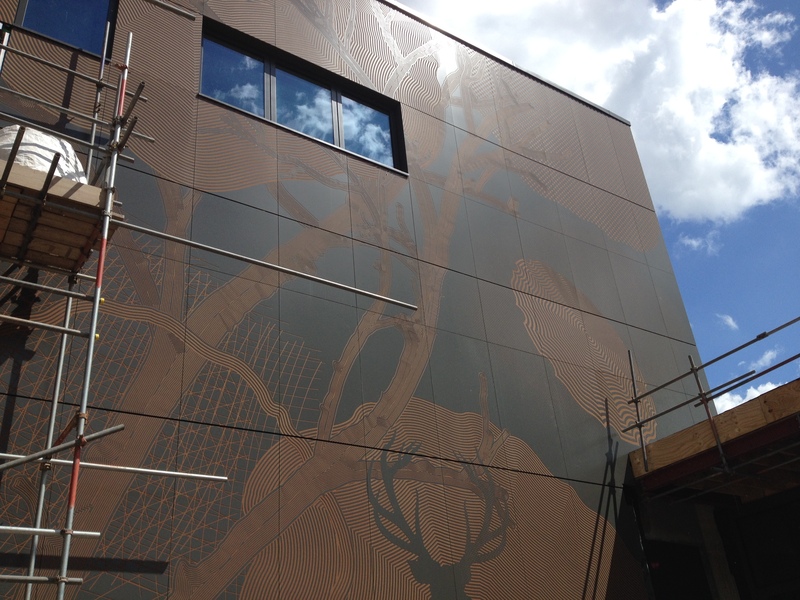 West Elevation cnc ‘drawing’ on the Rockpanel rain screen. 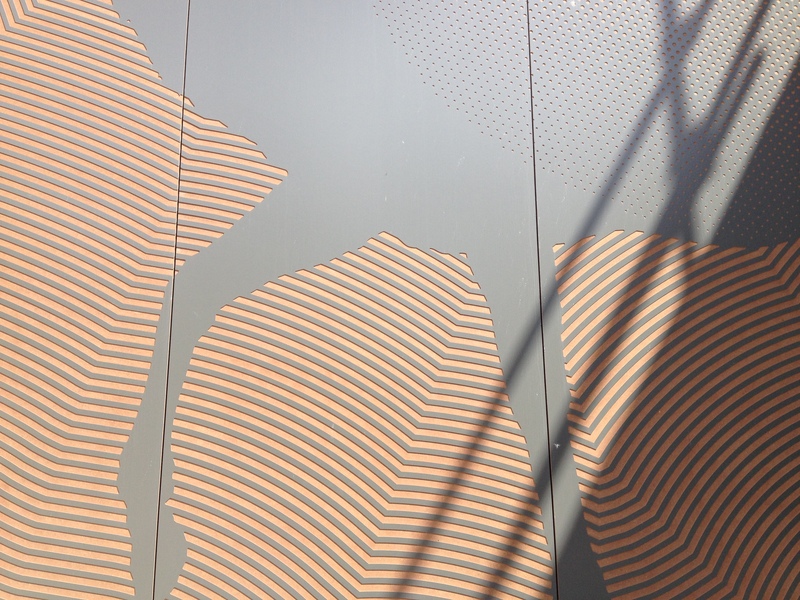 Cnc Rockpanel ‘drawing’ up close, which reveals the finer detailing and shadows cast. 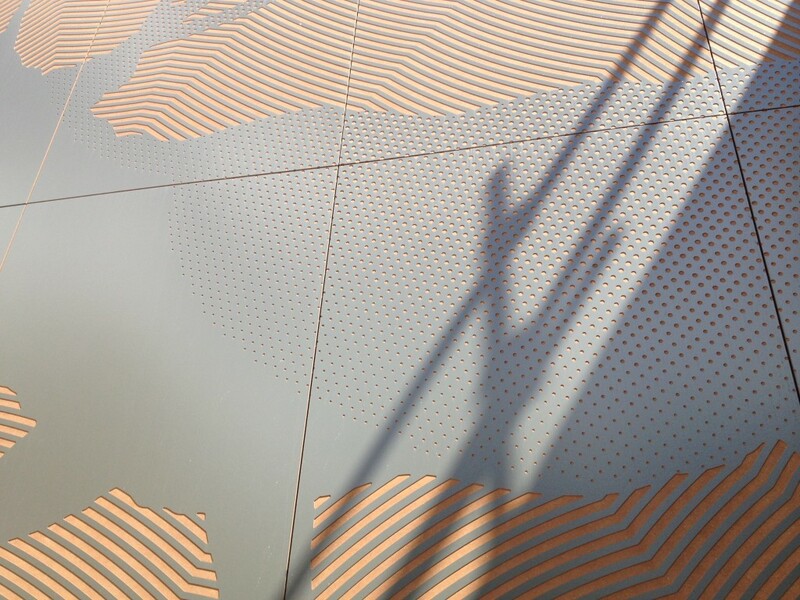 Detail: cnc routed Rockpanel ‘drawing’, up close. 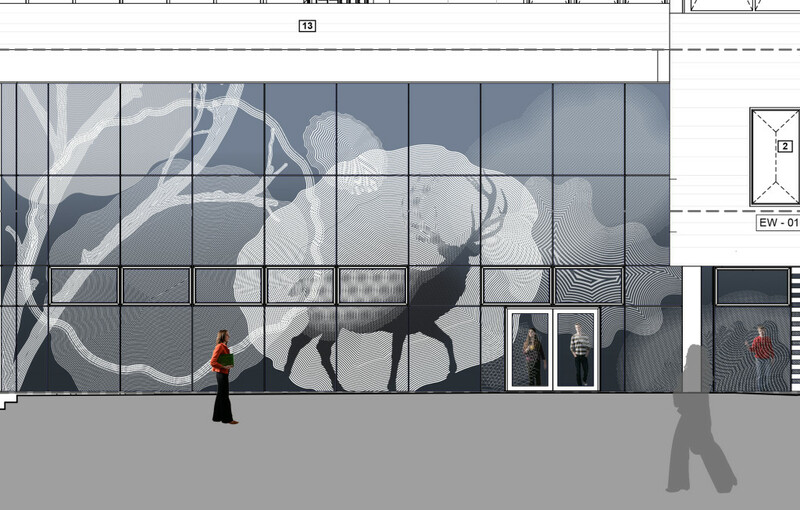 Draft designs for the glazing manifestation. 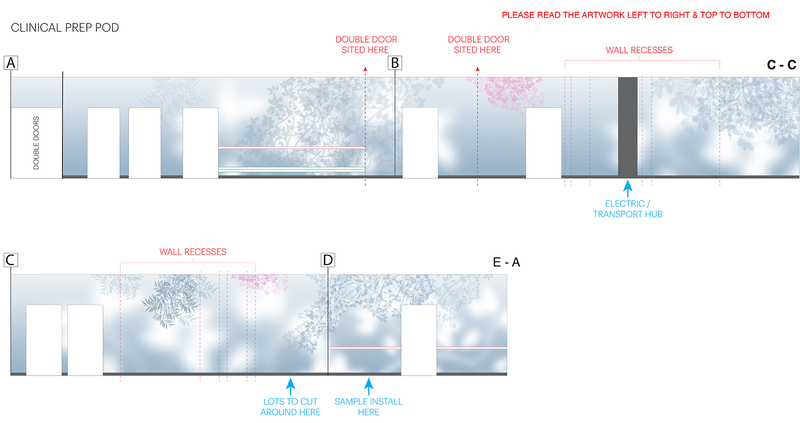 The first drafts for the glazing manifestations were produced in January this year and use the same iconography as the West Elevation cnc work. 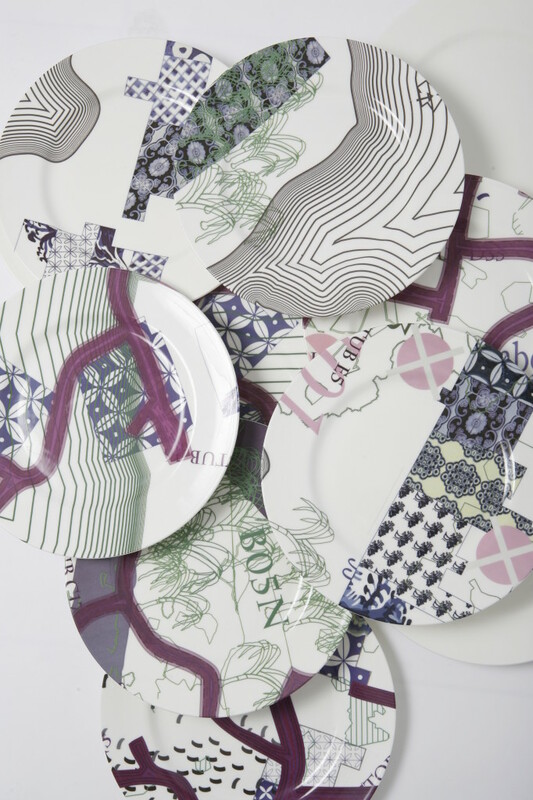 The manifestations however, being digitally printed, have no need for hard edges and manageable cutting paths. 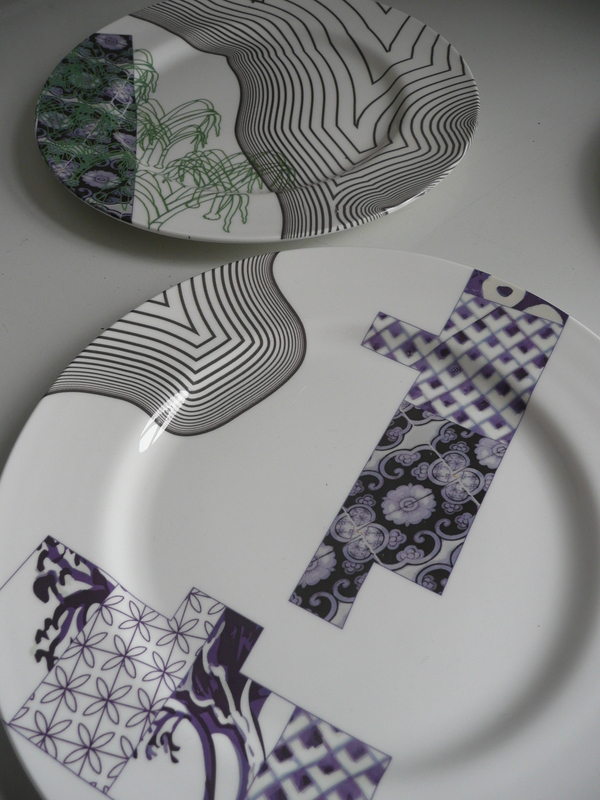 The designs will work with transparency and light to achieve their results. 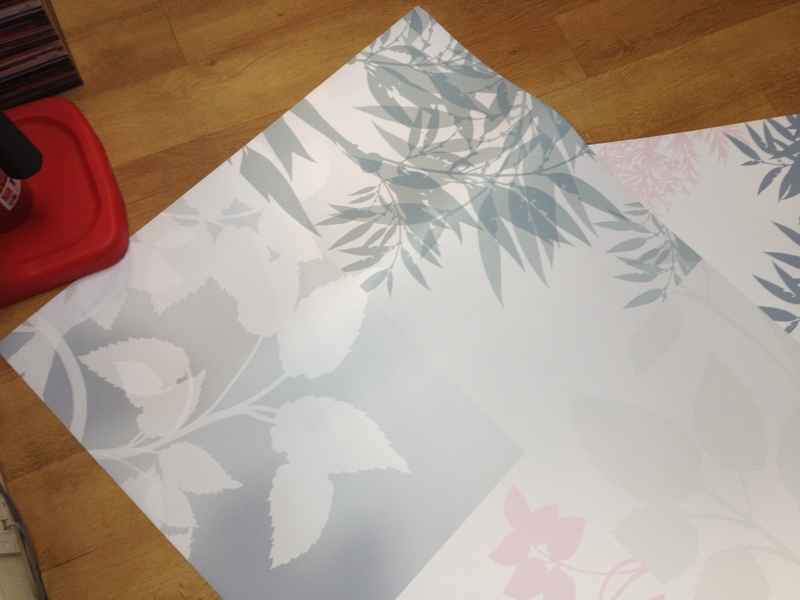 Digital printing further allows for a range of softer and finer details to be introduced. 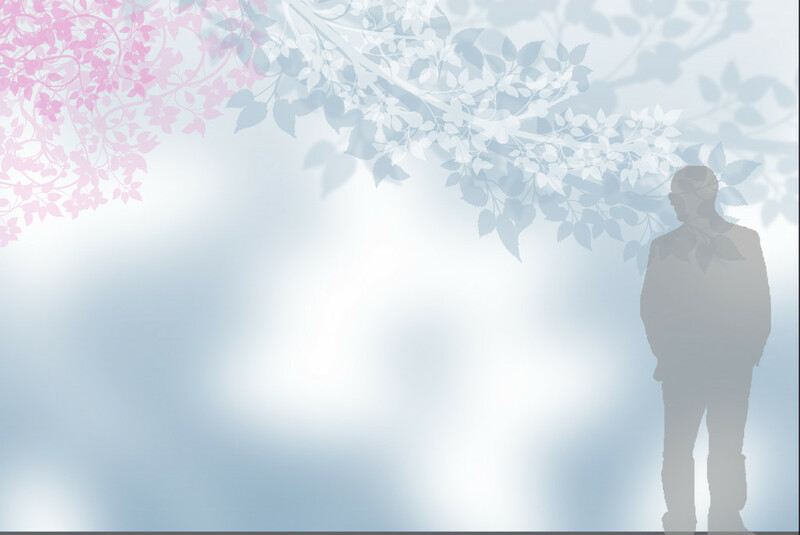 This is what I am currently working on. 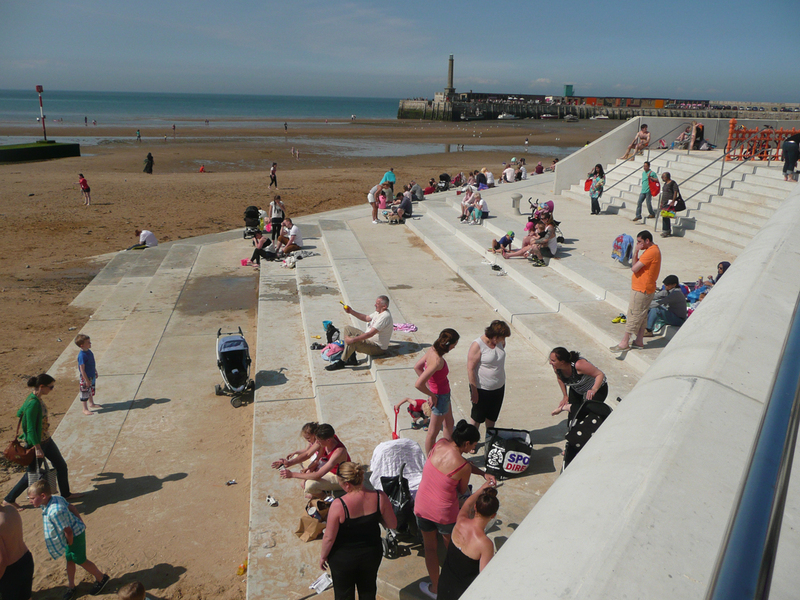 The manifestations serve a distinct purpose and have to comply with building regulations. 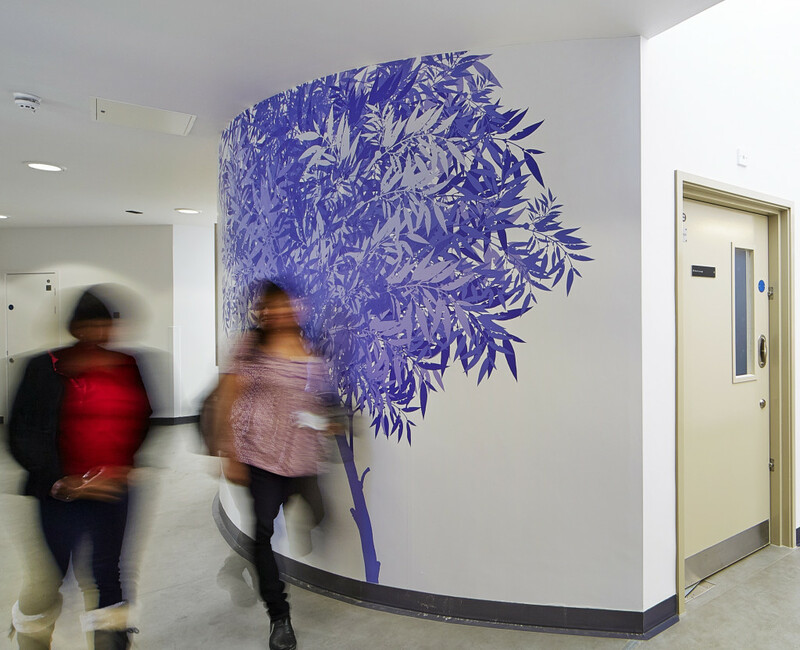 Beyond that, the artwork can develop in many original ways to drift through the building. 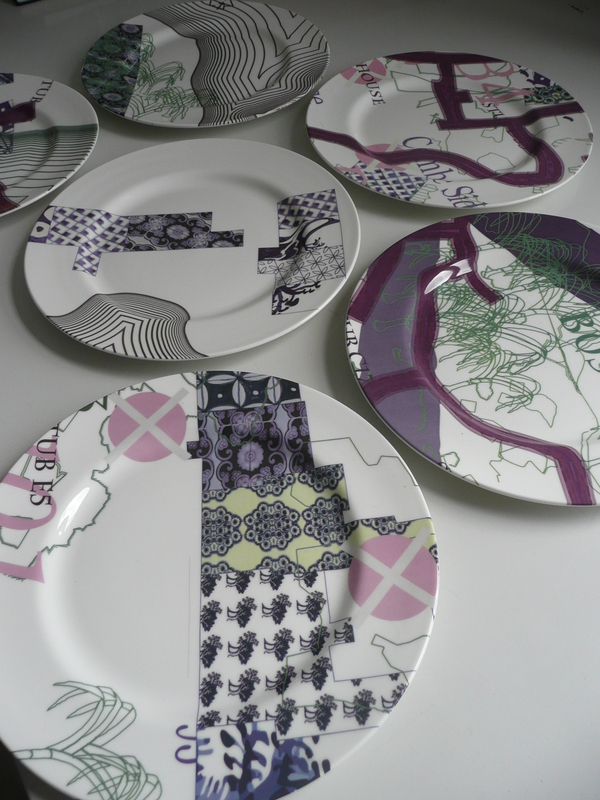 Work began to prepare the unit for the installation in March this year. What appears to be a simple case of ‘wallpapering’ a space couldn’t be further from the truth within an environment such as this. Sensitivity to the treatments being carried out within the unit is paramount. 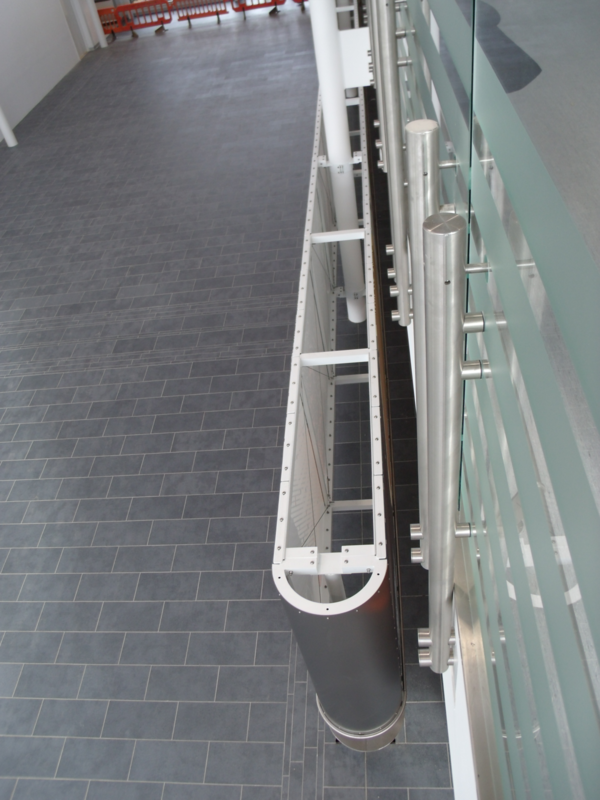 The ongoing quality and appearance of the DTU must be considered, even during renovations and repair works. As this is a day treatment unit, weekend working for the specialist contractors from VGL is the only option. This means that the project has to be undertaken over a number of consecutive weekends, which appears to extend the project for longer than it really warrants. 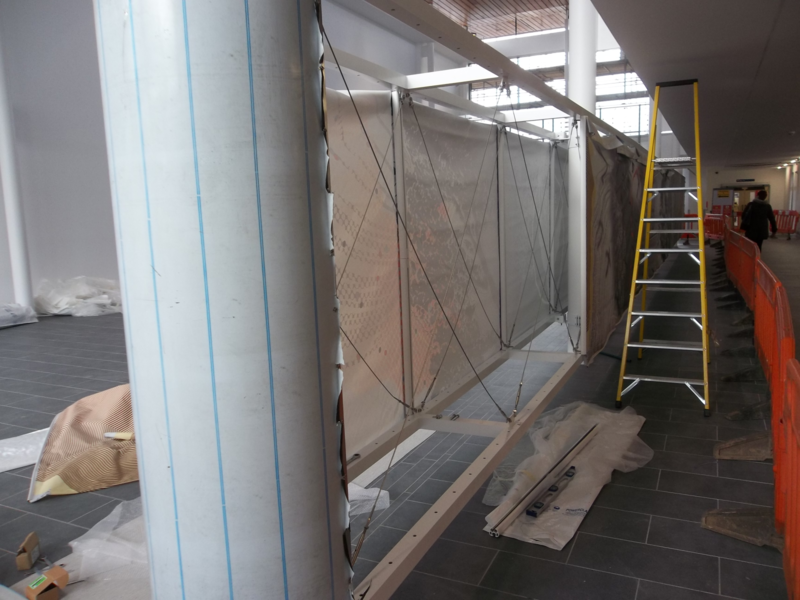 The following images show the first area to be installed. These are not finished images as further works are due to make good the final positioning of furniture and fittings etc. 28th April 2014 The first panels are installed. 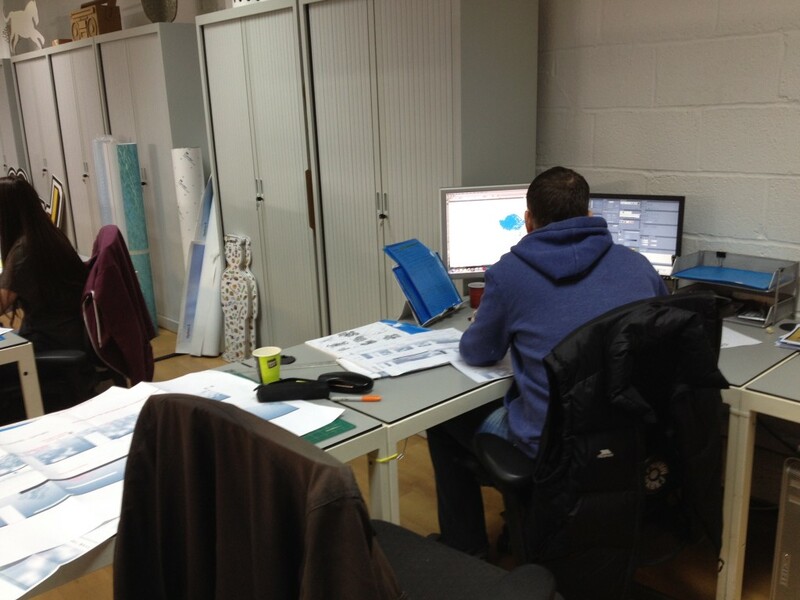 This is a test area to ensure that the production and installation methods we have established, do in fact work on site! 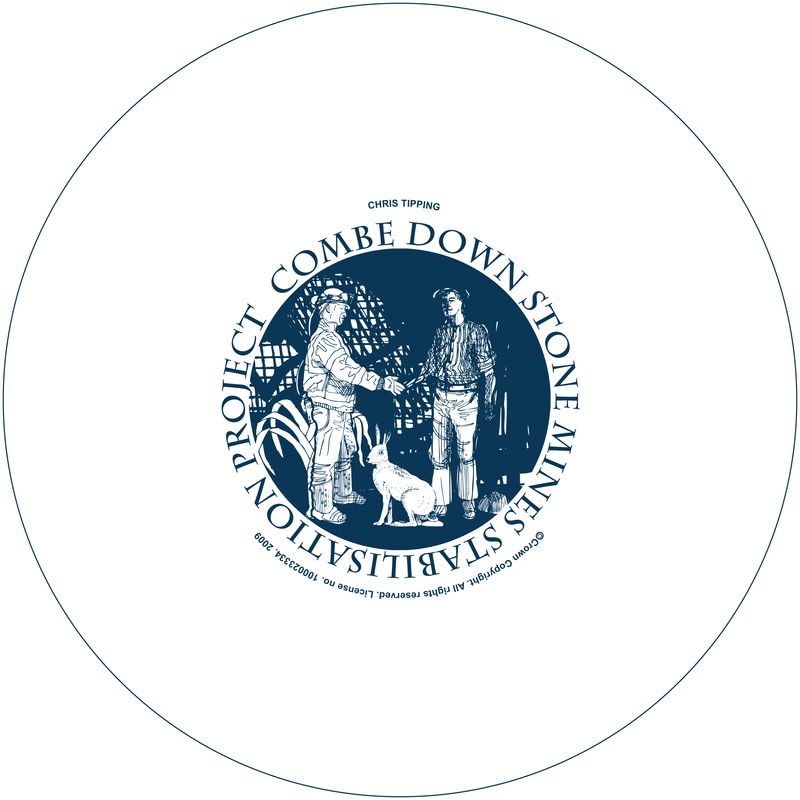 Many people make up the wider project team. They have to be consulted and become involved to enable the works to happen. 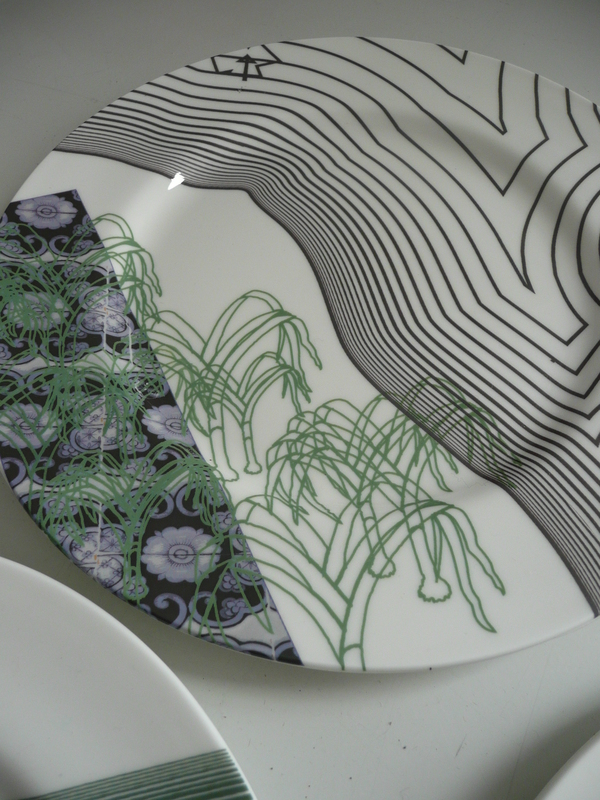 This is time consuming stuff and I am so grateful to Ruth Charity, the Arts Co-ordinator for the Oxford University Hospital NHS Trust who has steered this project since the outset, through its fair share of stormy weather ! The staff particularly have been patient and encouraging throughout. 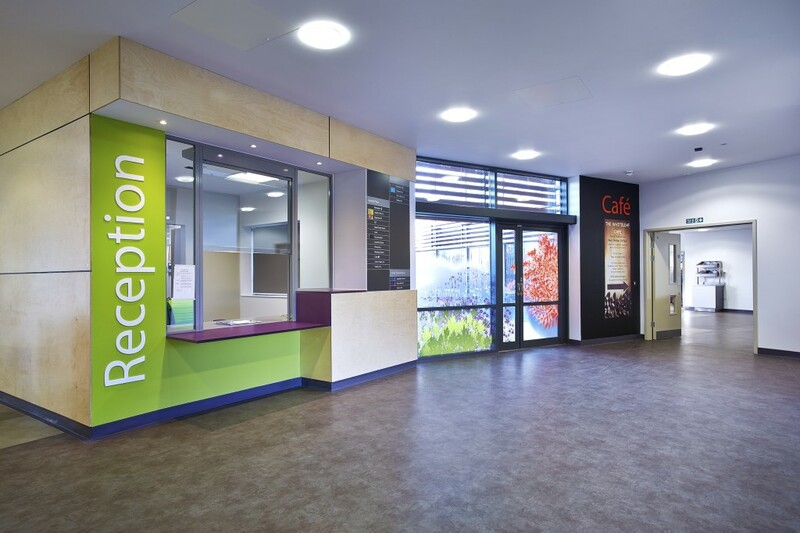 We have been working alongside Carly Birkett, Account Manager at VGL, Reading, who has collaborated extensively on the design production, manufacture and installation planning for the project. 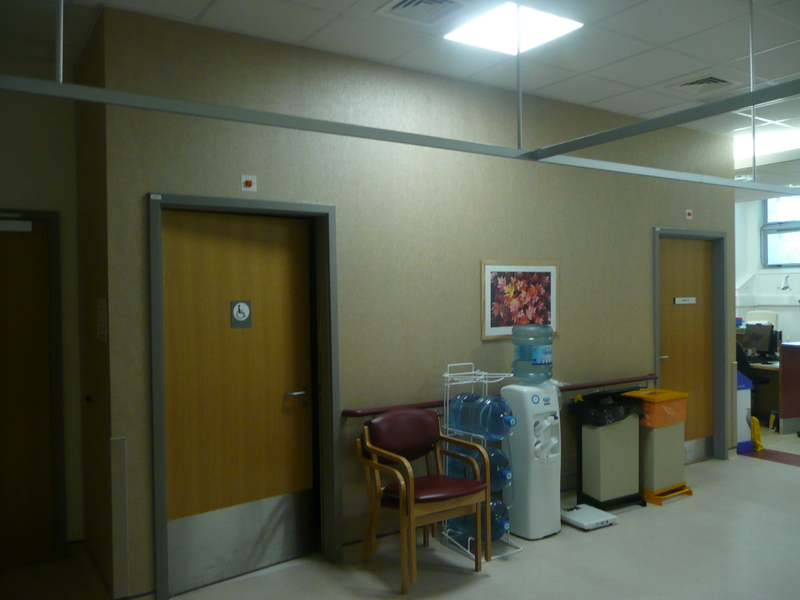 By May 2013, we had small scale sample panels produced and installed within the unit in July 2013 for a number of weeks to gain feedback from staff and user groups. 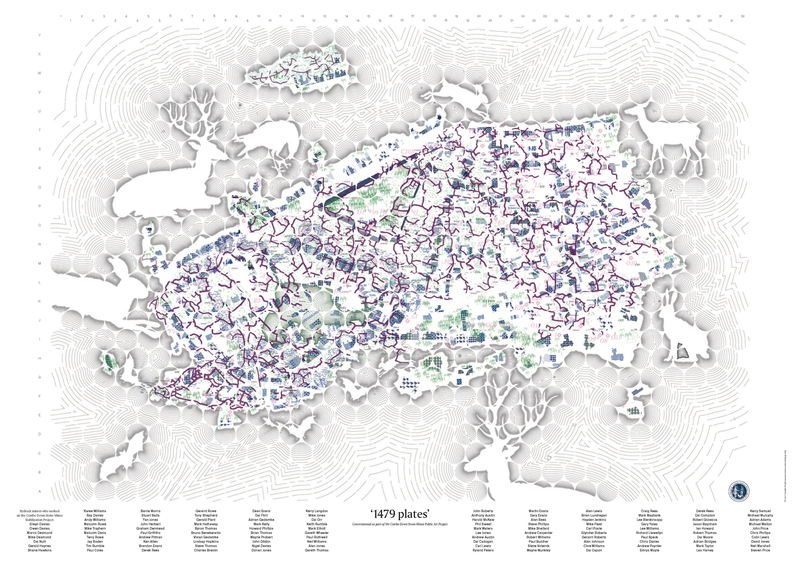 Following this period, the detailed design was revised and re-issued for comment. Detail: sample panel design for production and installation within the unit to gain comment & feedback on the ideas and concept. 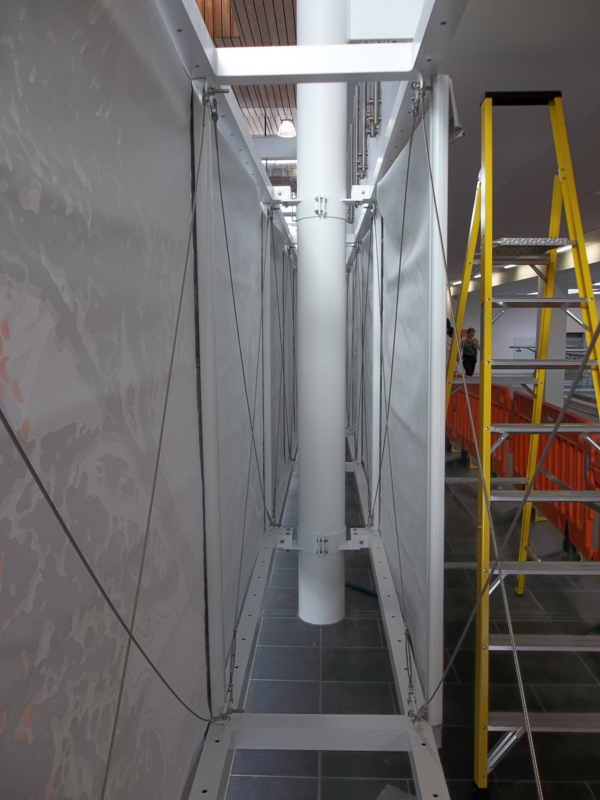 7th July 2013 – The sample wall coverings were produced and installed for comment. They were also testing the process of installation and the potential hazards and pitfalls of preparing the unit for the full installation. 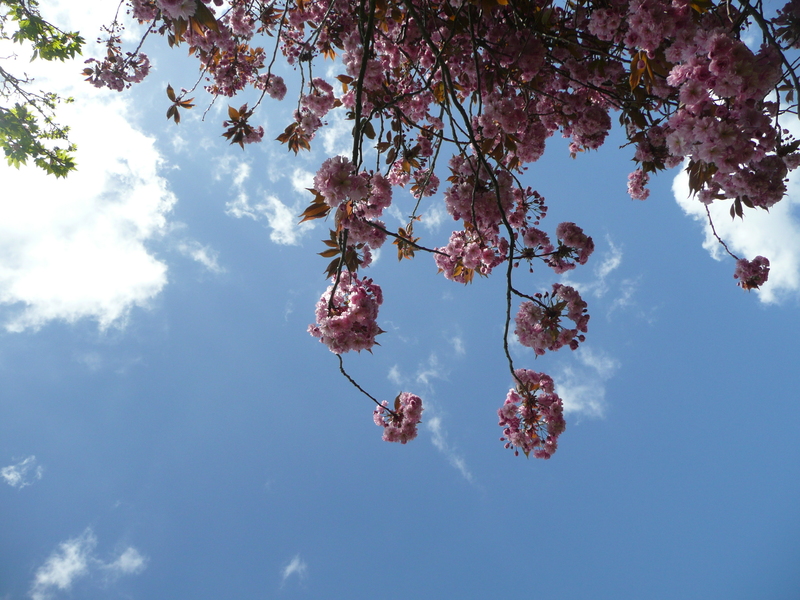 One issue which arose was that within the confines of the the narrow corridor, the blurred form of the tree had a rather dizzying effect on some people as they tried to focus upon it. We alleviated the problem by layering another transparent image, which was very sharp, onto the surface, which gave the eye a clear object upon which to focus. Hopefully this has addressed the issue. 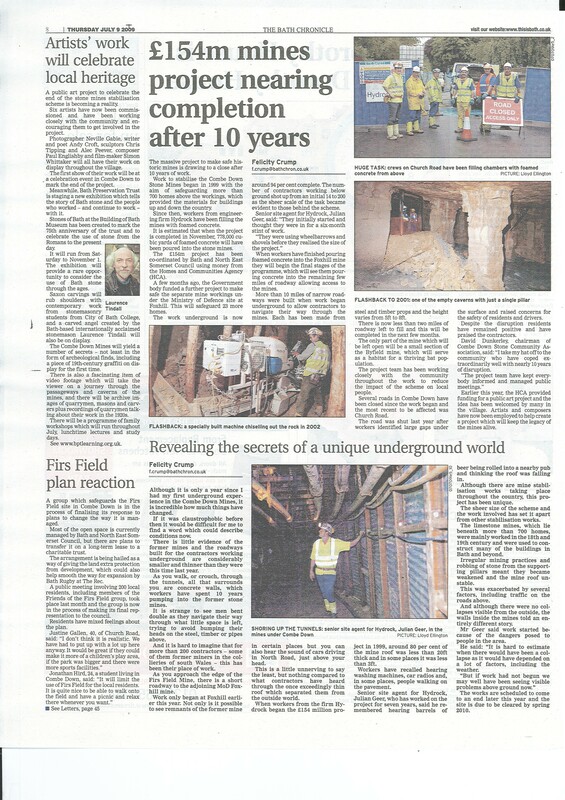 A number of trips were made to VGL’s offices and production unit in Reading, where I worked alongside the production designer in reviewing and building the production artworks. Detailed plans of all the interior elevations were plotted by VGL. 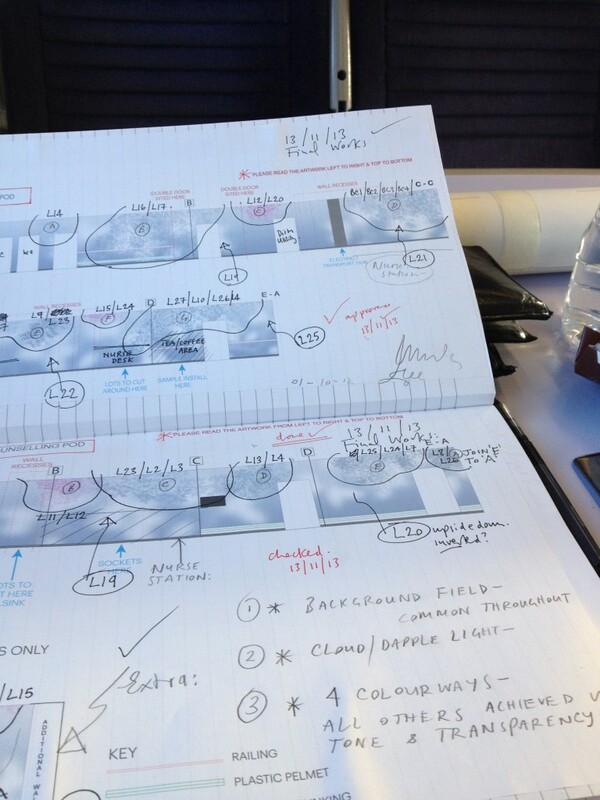 Carly Birkett made a number of site visit to take measures and ensure the right drawings were produced. 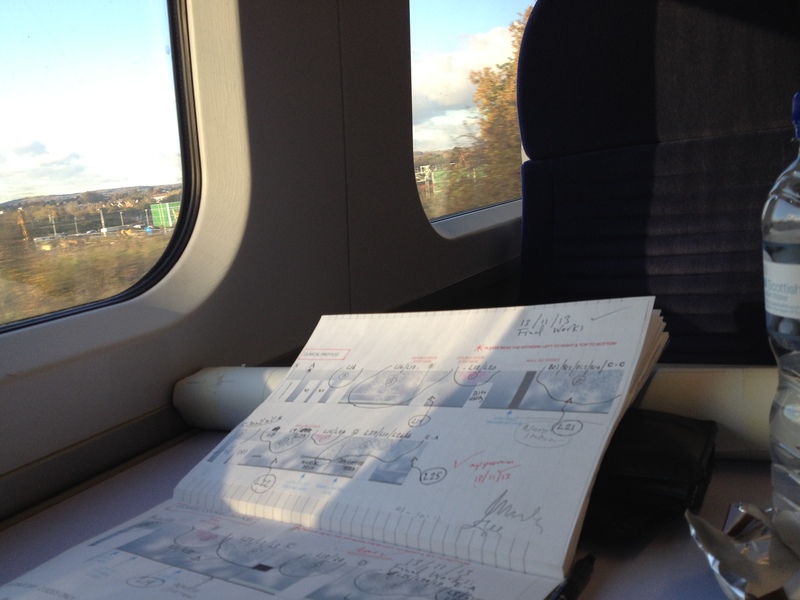 19th November 2013, reviewing drafts on train home after meeting in Oxford. 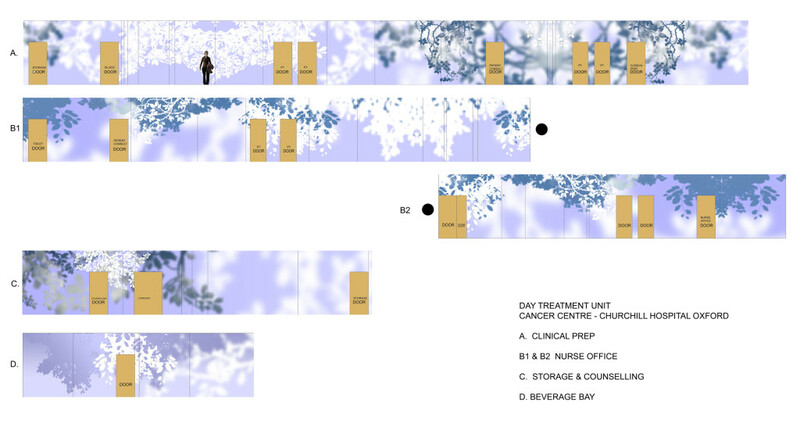 Final production design for Clinical Preparation Pod area. 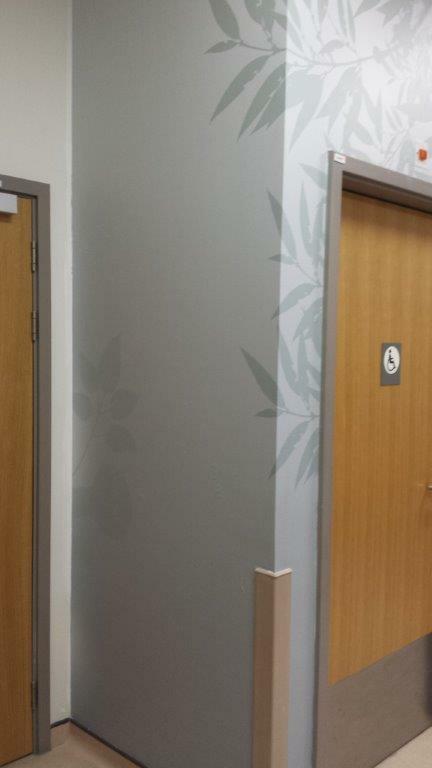 Detailed production design for the Nurse Office Pod area. 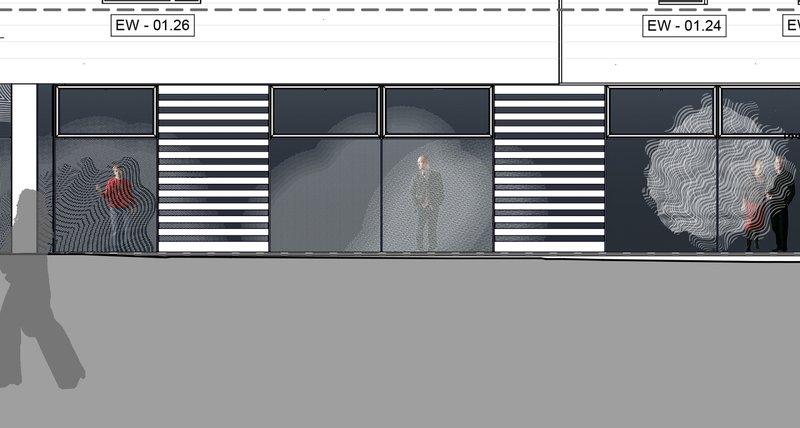 Final production design for the Storage / Counselling area. Detail: A partial view of the individual elevations in linear form which make up the interior ‘island’ or glade within the unit. Only small sections of the walls can be seen at any one time. 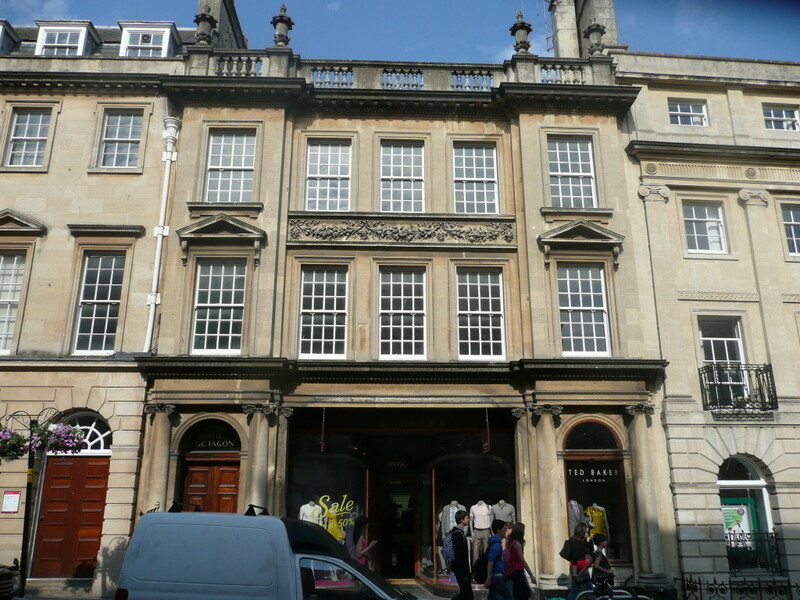 The elevations will be interrupted by doors and direction changes etc. 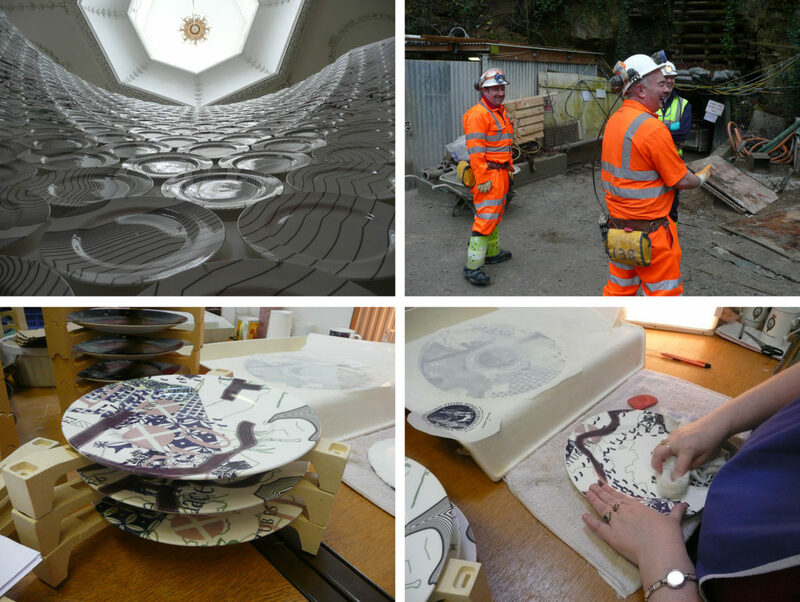 The final designs were then sampled and full scale sections delivered to the Trust for review and comment. 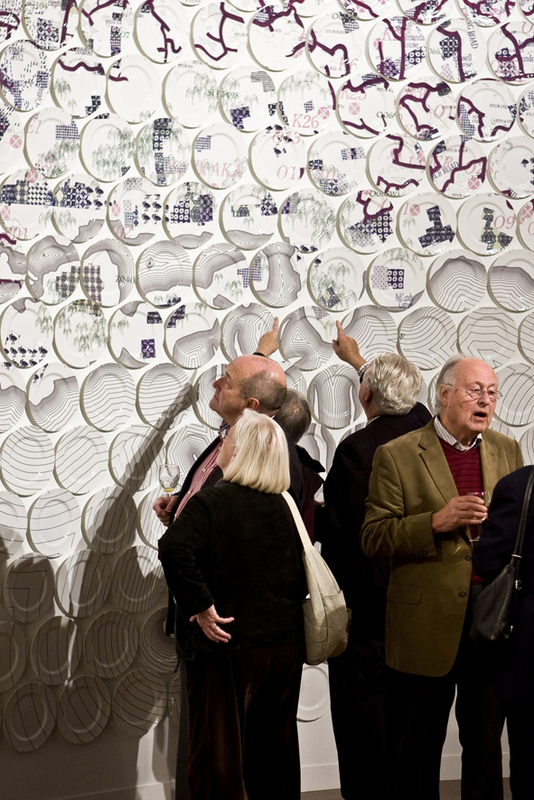 As you can see from the following images, the panels were quite a handful to manage and manoeuvre. 5th December 2013 & a trip to Oxford to review the new samples. Carly Birkett, Accounts Manager for VGL and Ruth Charity, Arts Coordinator for Oxford University Hospitals NHS Trust, hold up the sample panel for staff and me to view. 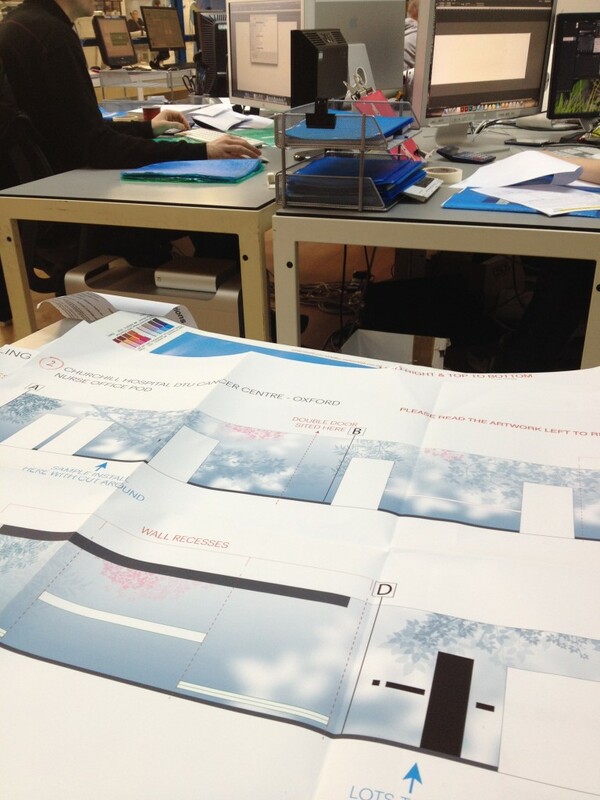 On 5th December 2013, we finally approved the samples panels produced from the detailed production designs. 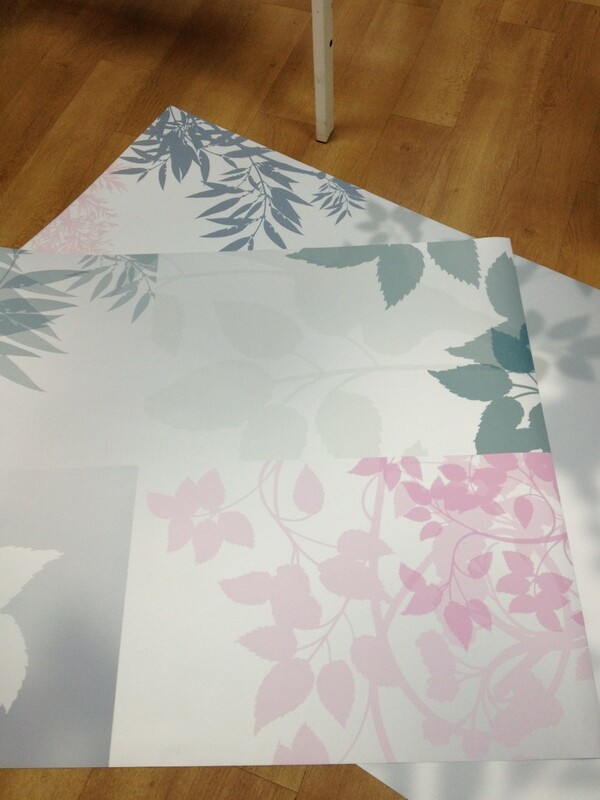 From here on it was all go to set a schedule for print, manufacture and installation. 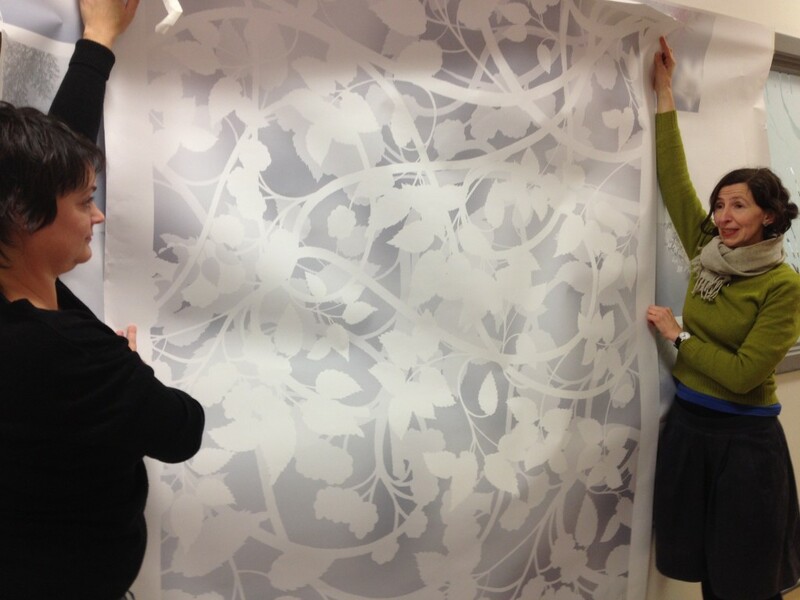 This is a full scale sample panel for an area of bespoke wall covering. VGL produced many such sample for us to approve and have been incredibly understanding and helpful in bringing the project to fruition. Ruth Charity, Arts Co-ordinator is on the right of this image & Carly Birkett, Account Manager for VGLis on the left. 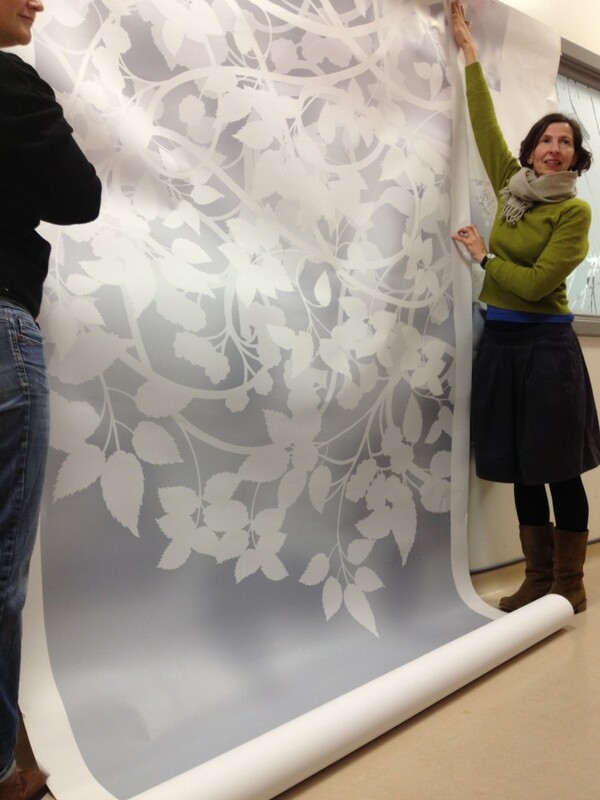 This arts project was commissioned in April 2012 for the Cancer & Haematology Day Treatment Unit, aka DTU, at Churchill Hospital, Oxford. Ruth Charity, the Arts Coordinator for Oxford University Hospitals NHS Trust has been instrumental in delivering the arts strategy. The Cancer Centre opened in March 2009 & was delivered by the Churchill Construction Consortium and designed by Steffian Bradley Architects. 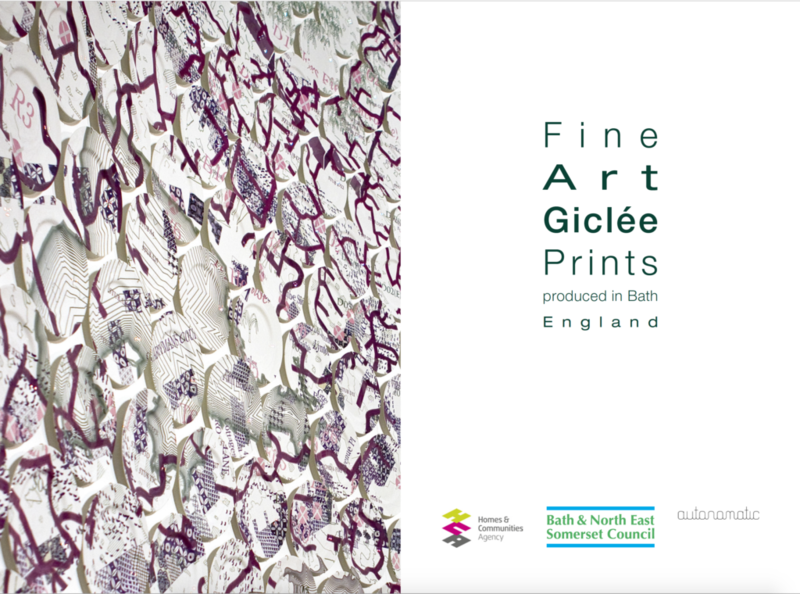 The art project is currently in production and installation is starting on site this coming weekend. 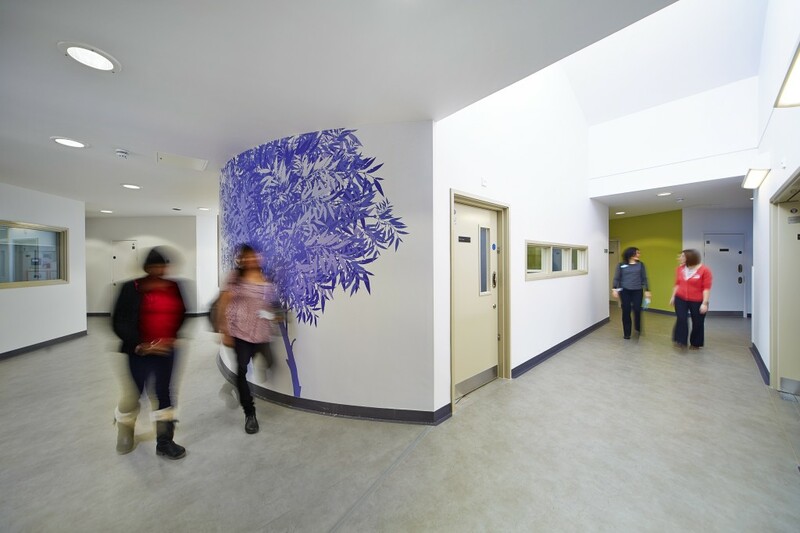 The project brief described the unit as: “Between 70 -90 patients/day attend the Day Treatment Unit requiring treatment for varying malignancies and benign blood disorders. The treatment regimens (e.g. chemotherapy / blood transfusions) can be complex & lengthy, taking anything from 30 minutes to several hours, with some patients attending twice a week and others once every three weeks. 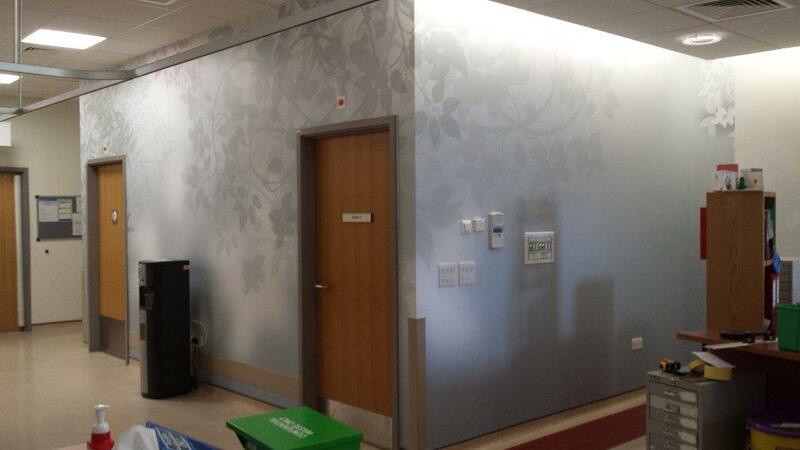 The Day Treatment Unit consists of one long horseshoe-shaped room,accommodating 12 beds & 30 chairs. 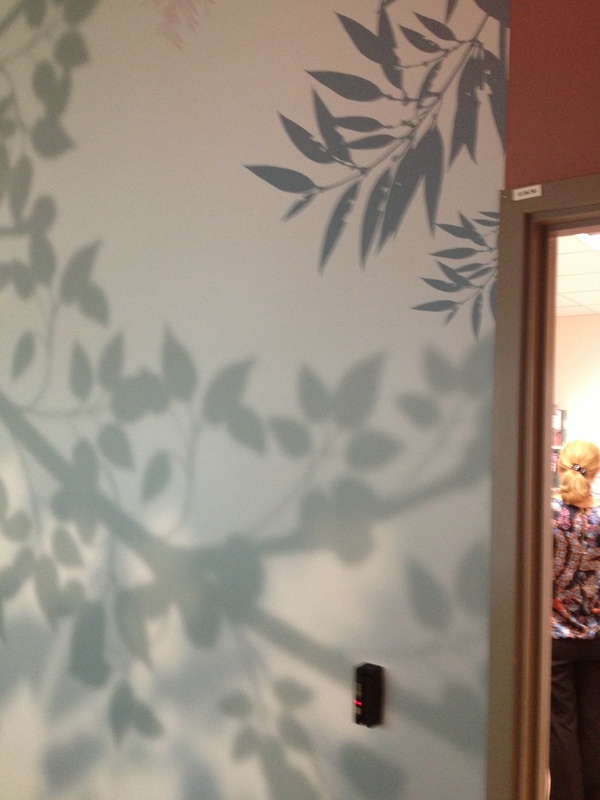 Currently there is little artwork on the walls and there is little of interest for patients to view. The windows are very high so there is no opportunity for patients to look out and thus no sense of what the weather is like or even what season it is. 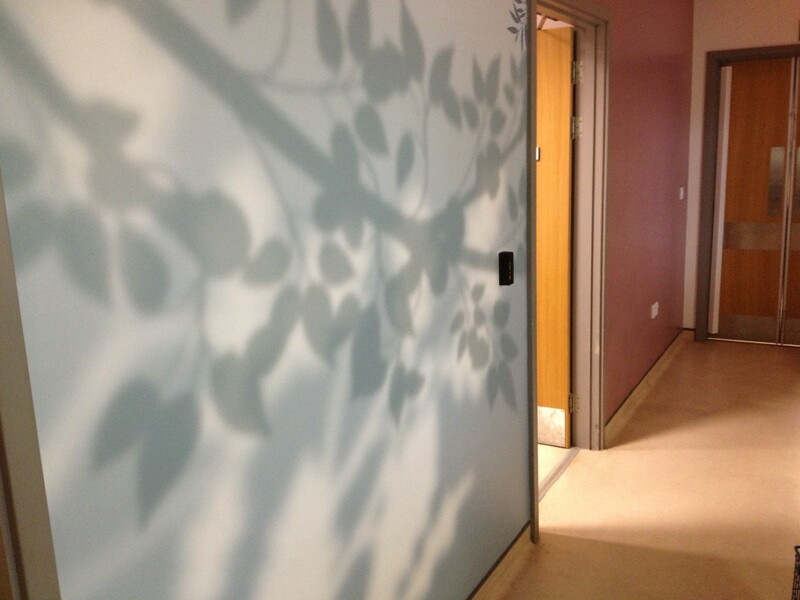 As a space, which patients visit on a regular basis, it offers little to lift the tedium of repeat visits”. Day Treatment Unit, Nurse Station. 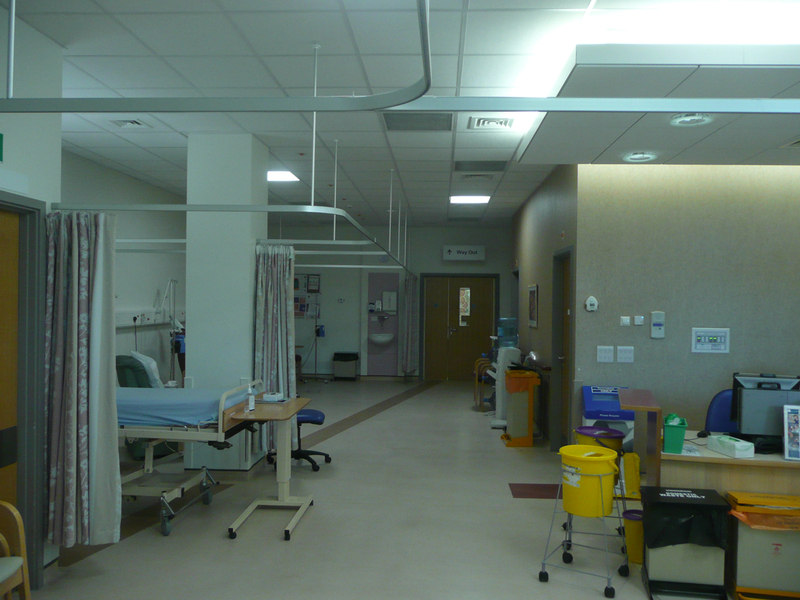 The patients within the unit are treated in beds or chairs set out around the perimeter of the rooms, facing into the centre of the room with any windows and natural light behind them. This is a typical view of the space. Day Treatment Unit. 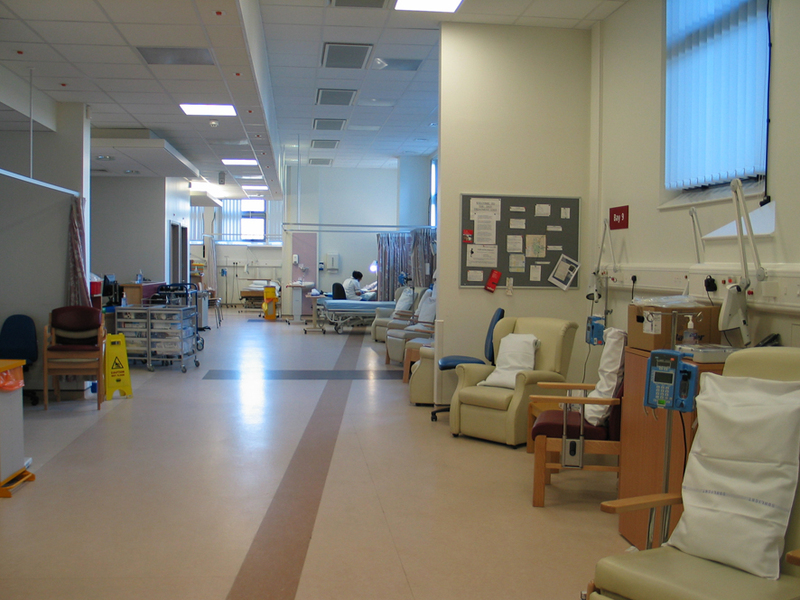 All the treatment areas face onto a central ‘island’ of nurse stations and clinical rooms and service corridors, which make for a rather un-relieving view. Some patients are here for up to 4 or 5 hours at a time. 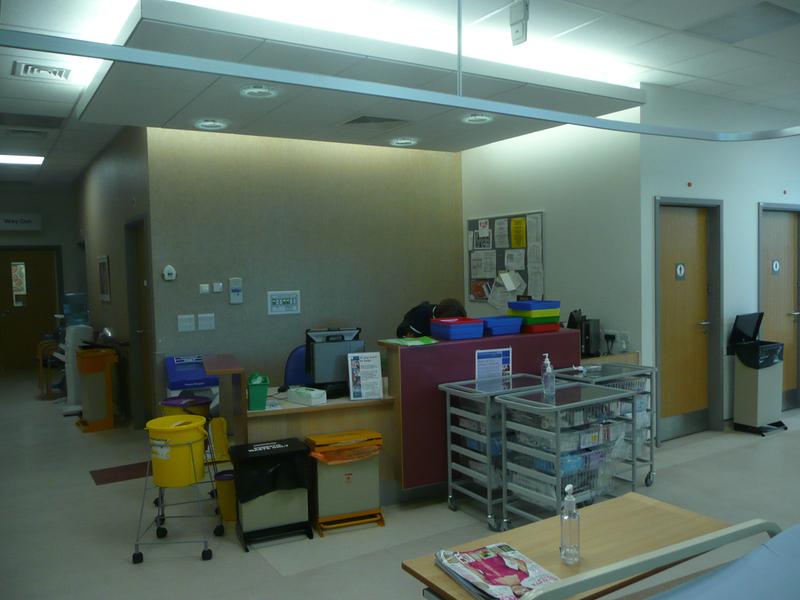 Day Treatment Unit, view from treatment areas with beds and chairs. Day Treatment Unit showing treatment chairs facing away from the windows. 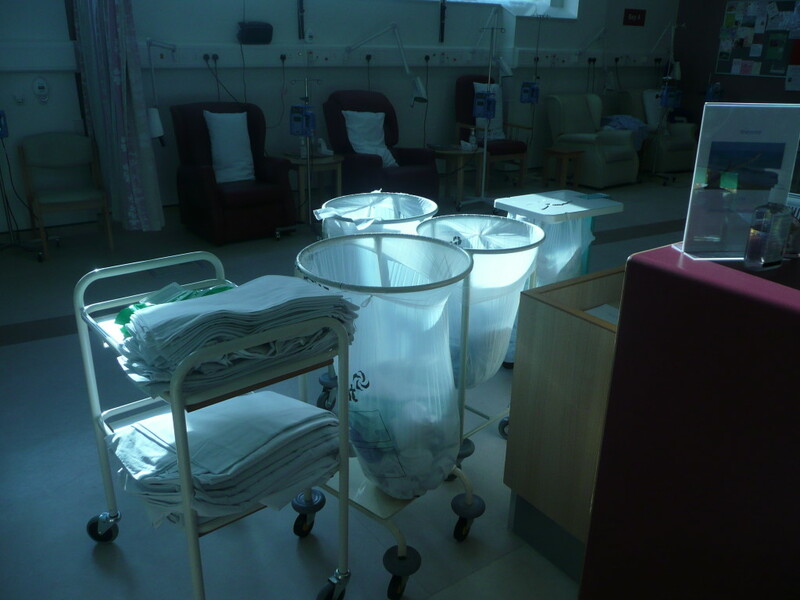 Although the nurse stations benefit from the natural light which comes in from a series of small, high windows, it does appear to diminish the experience of patients within the unit. 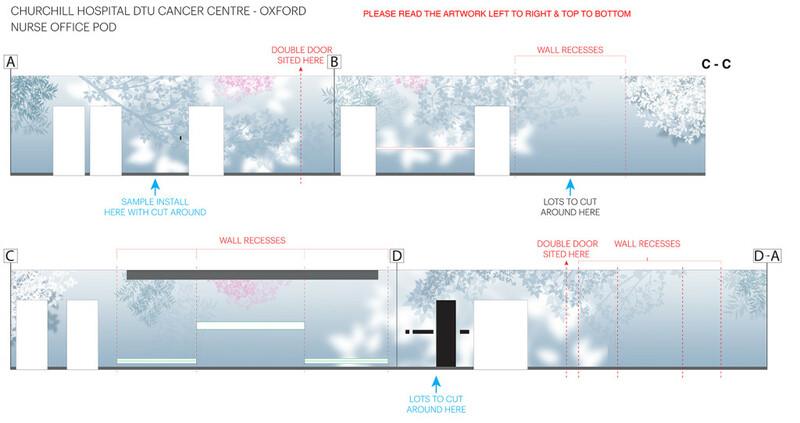 ‘Bringing the landscape in…;, The concept was driven by the woodland and planting which surrounded the Cancer Centre, very little of which could be viewed from within the unit. 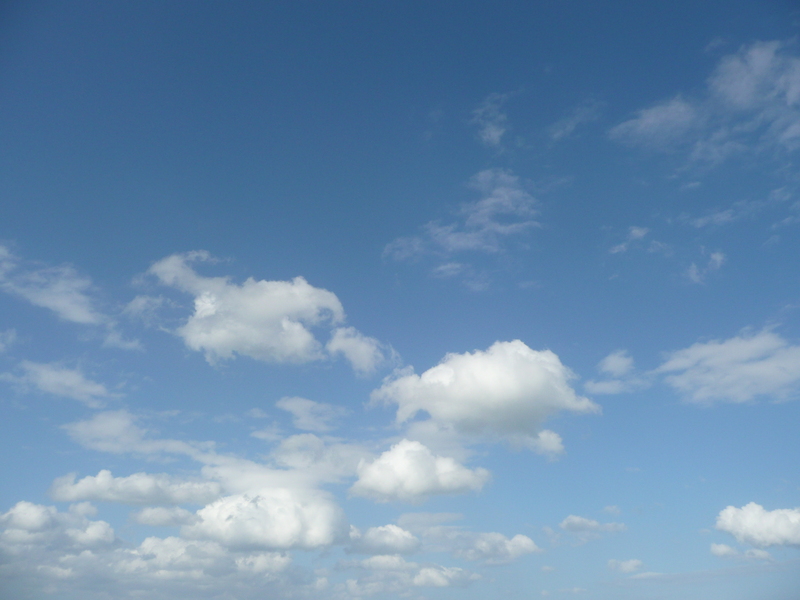 The sky was predominant as the windows are so high. Blue sky, clouds, rain, grey, bright, dull, overcast – all conditions which influenced our discussions and responses to the site. Our approach had to be considerate of and sensitive to the treatments being delivered here and the wellbeing of patients. 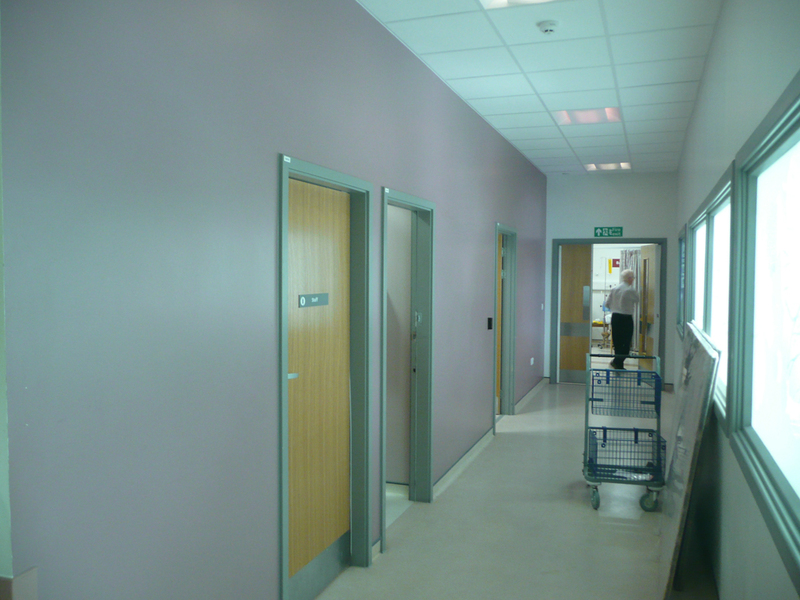 Scale and distance of patients from the walls opposite was a critical factor. We had to be extremely careful about colour & figurative detail and scale which could have a negative influence and impact on patients. 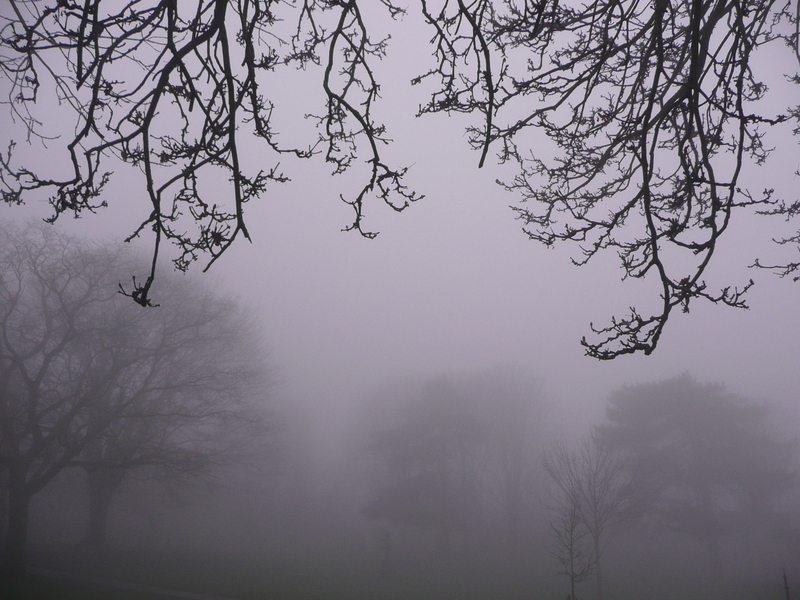 The more muted and soft views on an early misty morning image taken in a local park began to appear conducive to setting the stage for our intervention. 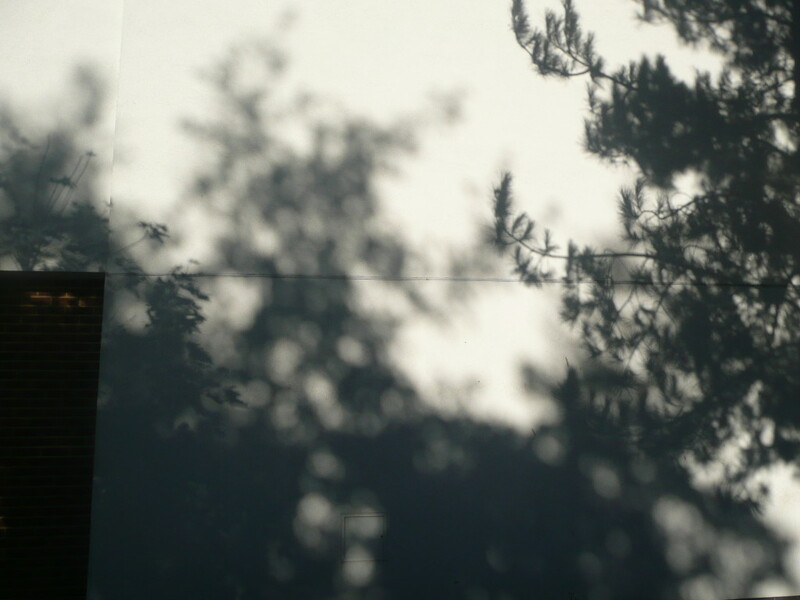 Tree shadows on a concrete wall are both sharply focussed or softly blurred depending on the distance of the tree from the wall. 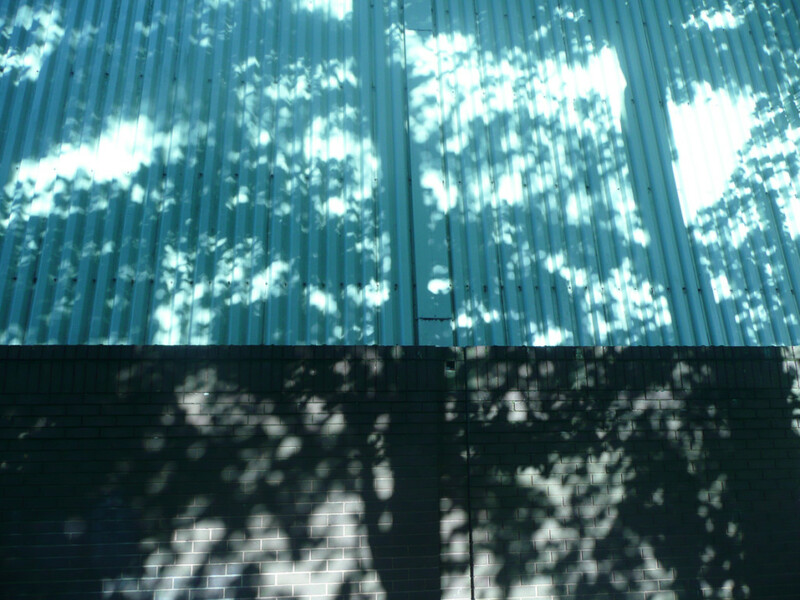 The shadows of trees here combine with the building onto which they are bast to create an abstract backdrop. 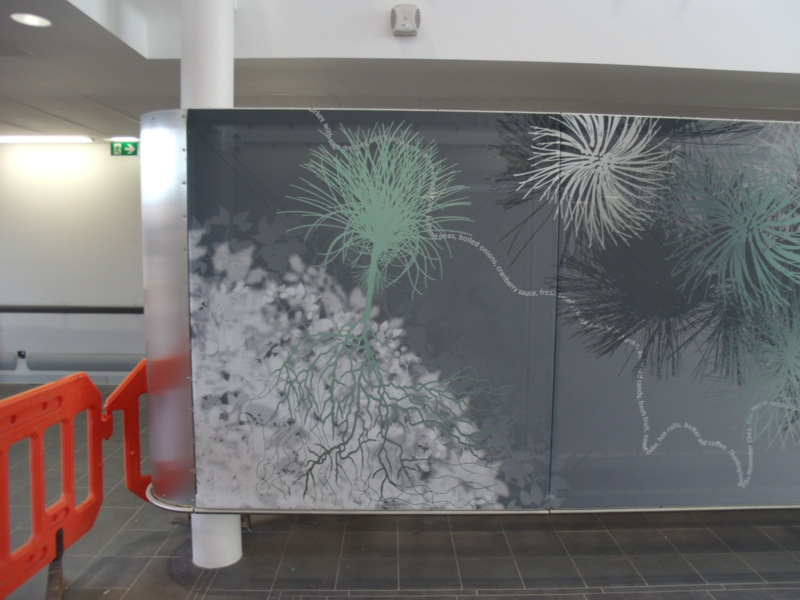 I have worked at the Cancer Centre previously within the adjacent Chemotherapy Waiting Room, where a large triptych – an architectural glass artwork, originally commissioned for the old Oncology Unit by GBS Architects, had been re-sited successfully as a screen between the patient waiting room and clinical offices and corridor. 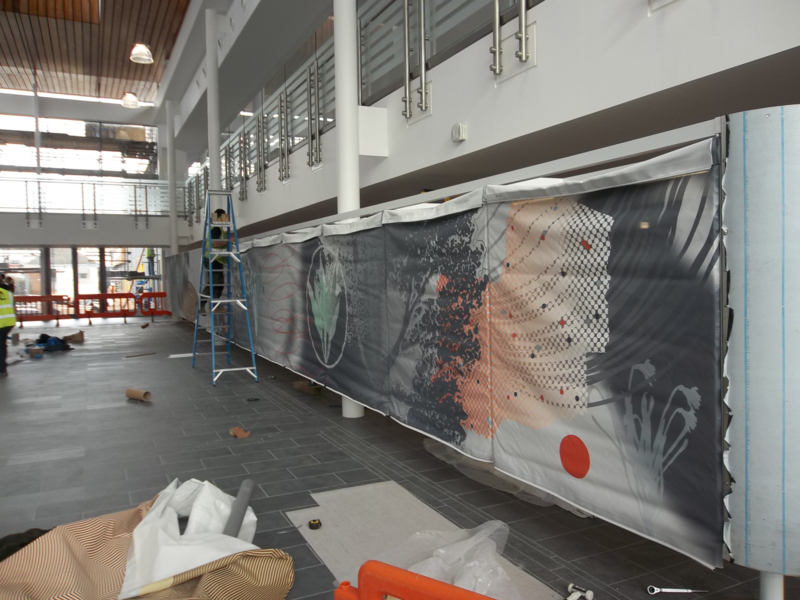 This work was further enhanced by digitally printed optically clear vinyl installed on all interior glazing panels within the waiting area by VGL Ltd. 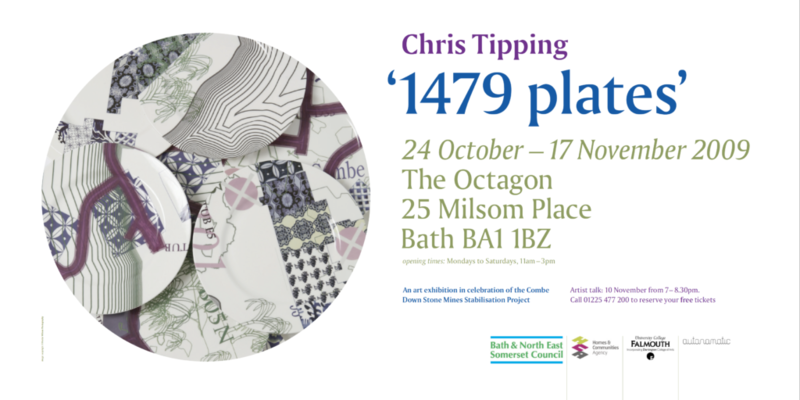 I will post an archive review of this project in due course under the heading ‘Chemotherapy Waiting Room’. The DTU project was initiated with a two day residency during which I talked to staff and engaged with patients. The delivery of treatments make this a very sensitive place to observe and great care was taken to be as unobtrusive as possible. There has been an ongoing process of engagement & he staff have been a continual joy to work alongside. 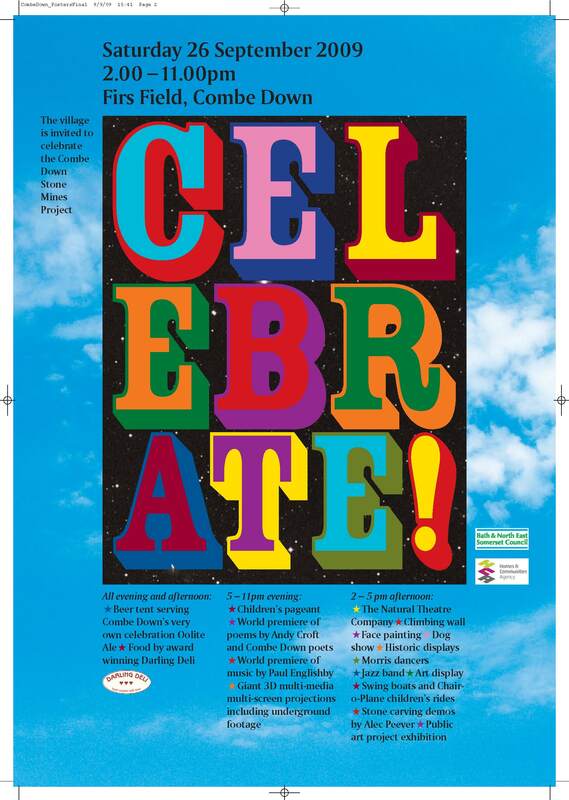 Their collective upbeat and supportive collaboration has made this project particularly special for me. The key staff, who smoothed the progress of the project throughout have been: Eliz Flanagan – Lead Chemotherapy Nurse, Jane Skelly – Chemotherapy Specialist Nurse and Moira Cunningham – Sister, Oncology and Haematology Outpatients. Other members of the Champions Group who informed my work & engagement within the department are: Claire Tasker – supporter, Julie Bourchier – former patient & Liz Creak – former patient. 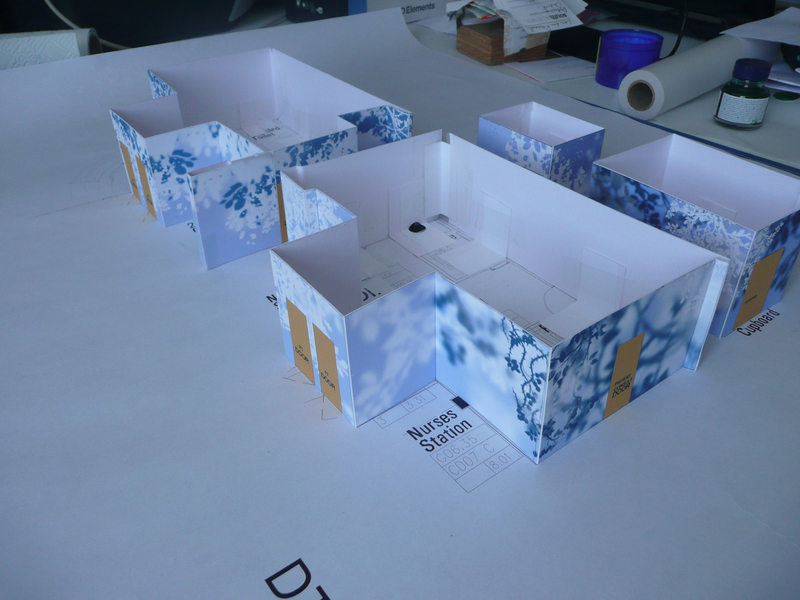 Initially I produced a to-scale model of the interior ‘island’, a cluster of rooms around which I was to base the installation. 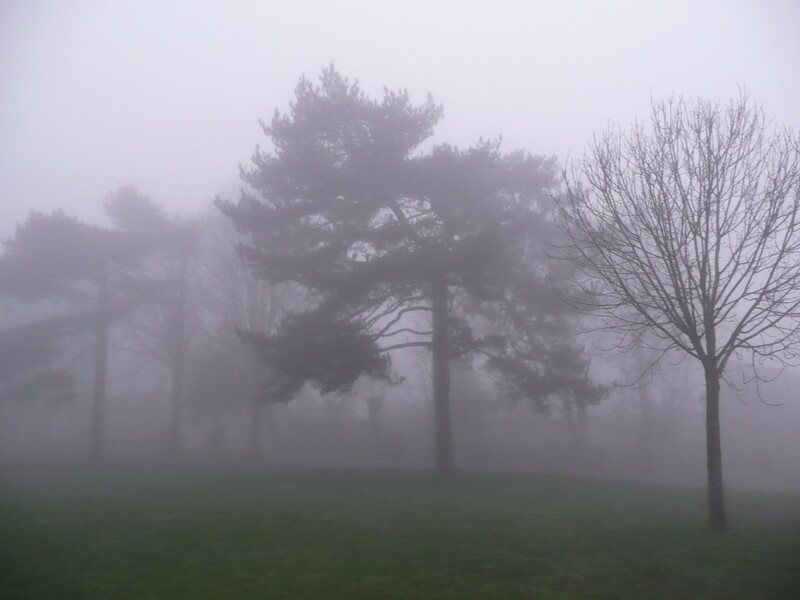 The idea was to create an interior landscape, or vista which almost felt as though the trees and plants were overhanging the space, creating an abstract misty glade to look into. Plan drawing of the DTU. The pink area outlined in red shows the ‘island’, a cluster of rooms at the centre of the unit around which the circulation flows. 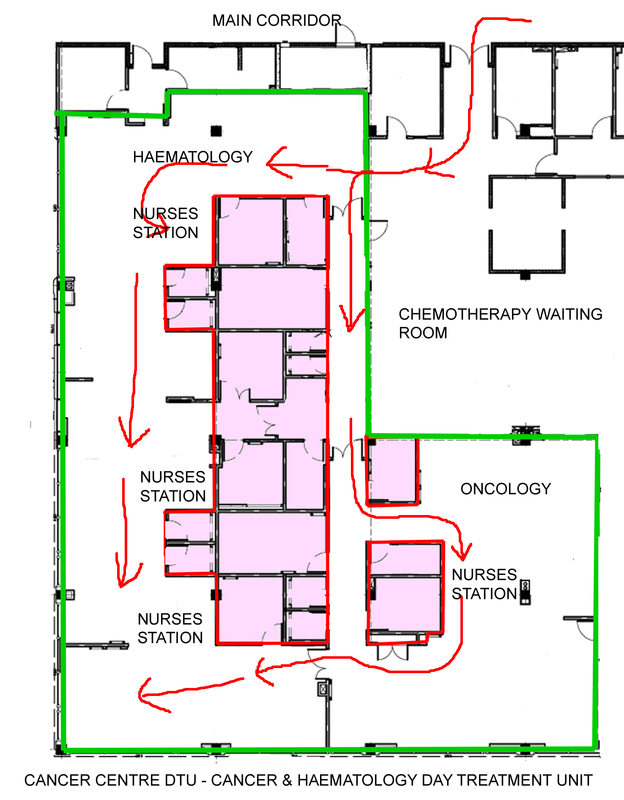 The green line shows the perimeter of the unit and the position of the treatment chairs and beds all aligned to face the ‘island’. 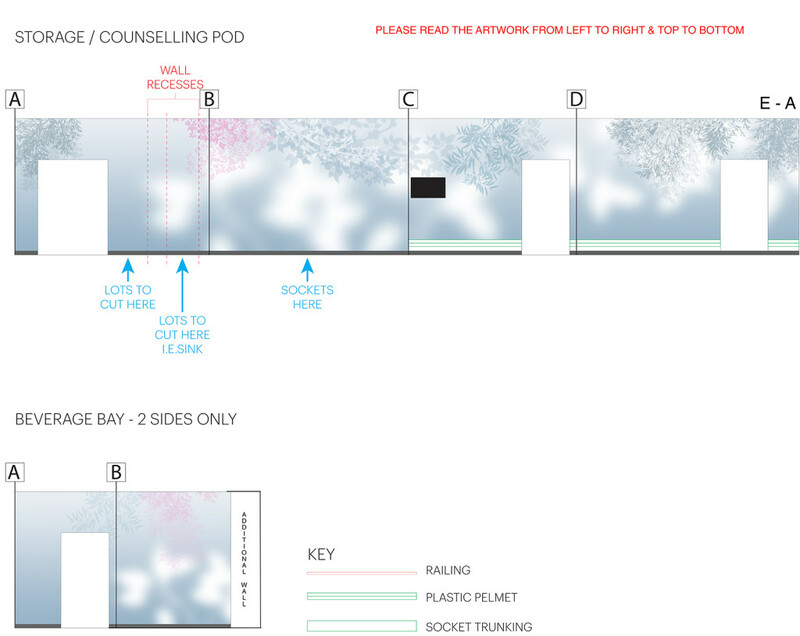 This is a scale model of the interior ‘island’ and a concept surface design to illustrate the approach. 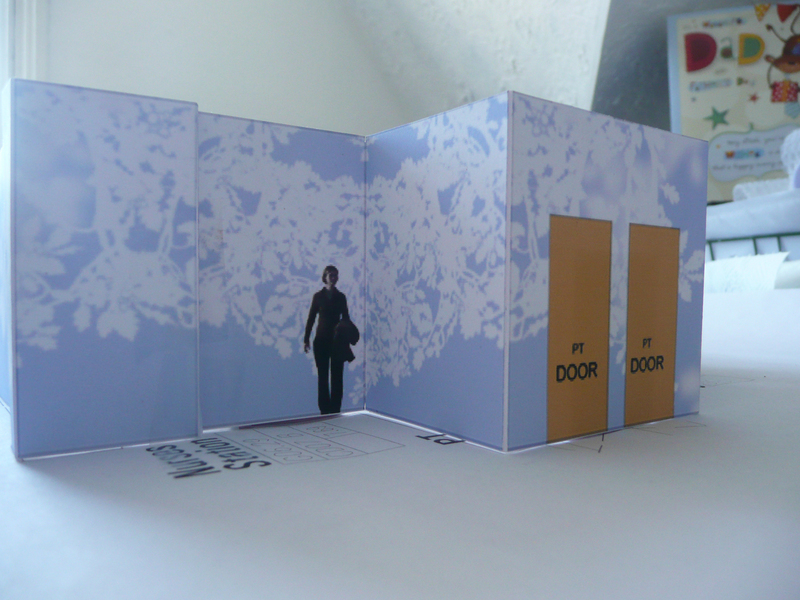 Scale model investigating the concept and approach. 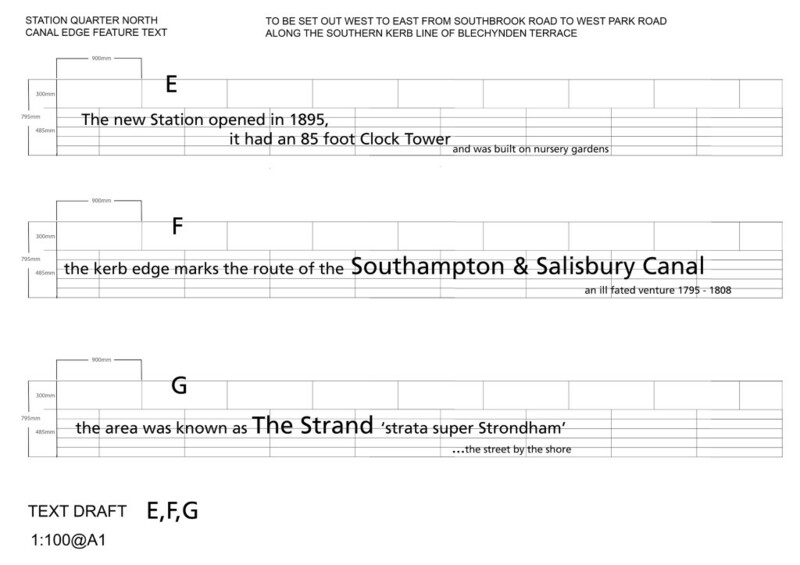 Draft for the ‘island’ elevations. 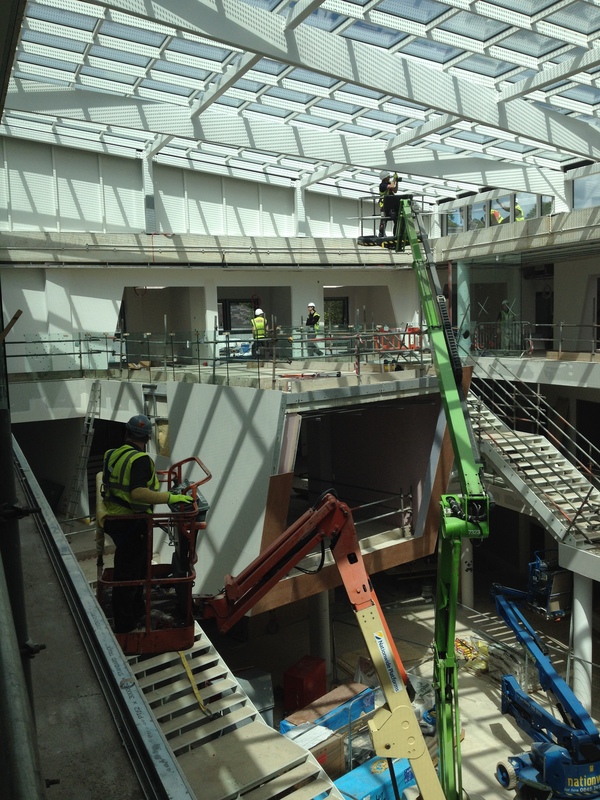 We have been working alongside Carly Birkett, Account Manager at VGL, Reading who have collaborated on the design production, manufacture and installation planning for the project. 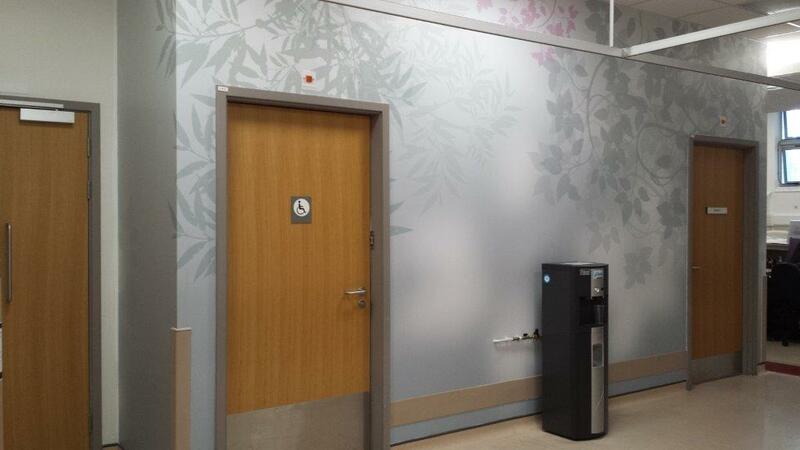 We have had small scale sample panels produced and installed within the unit for a number of weeks to gain feedback from staff and user groups. 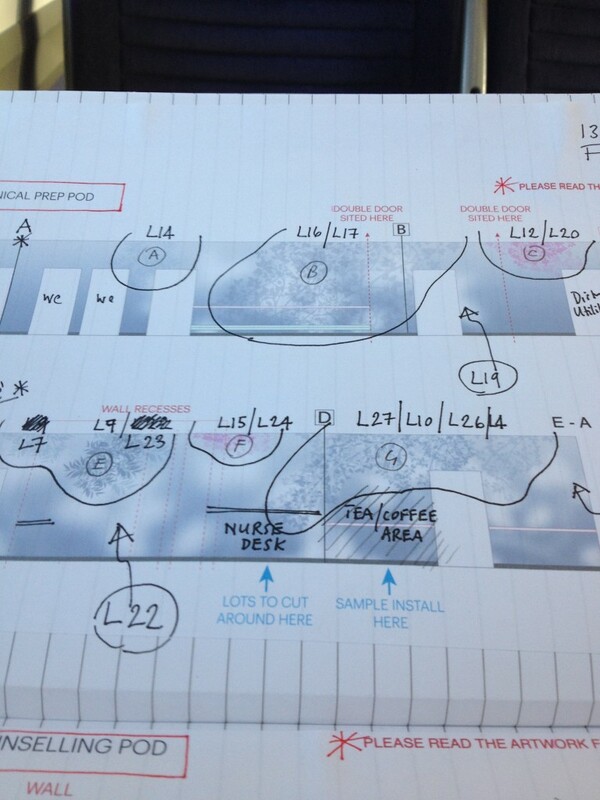 Following this period, the detailed design was revised and re-issued for comment. 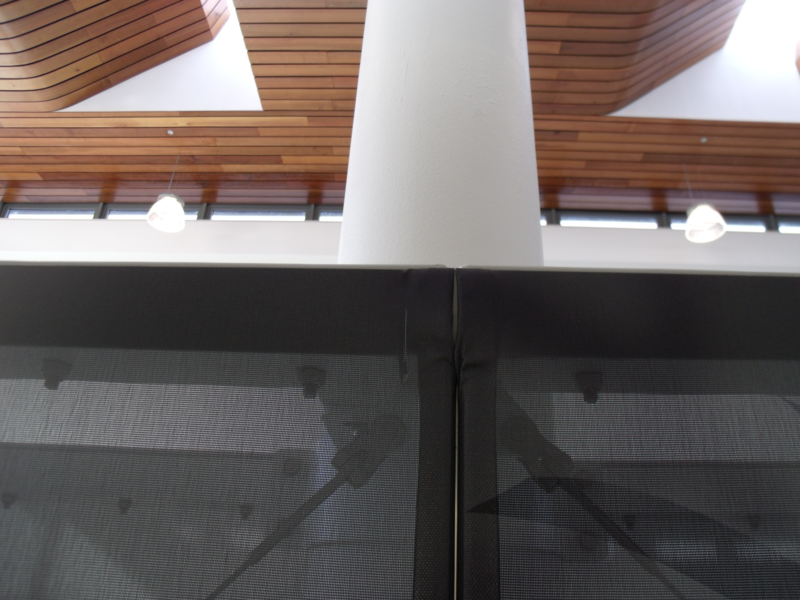 Architen Landrell, who manufactured and installed the tensile screen, sent me their project images this week. Some of these I hadn’t seen before, so am now posting for the first time. 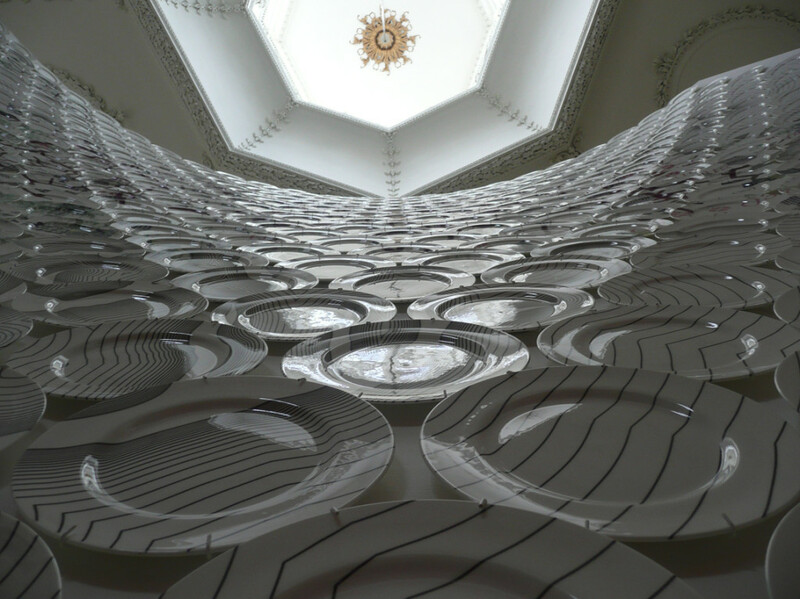 Looking into the central void space between columns. 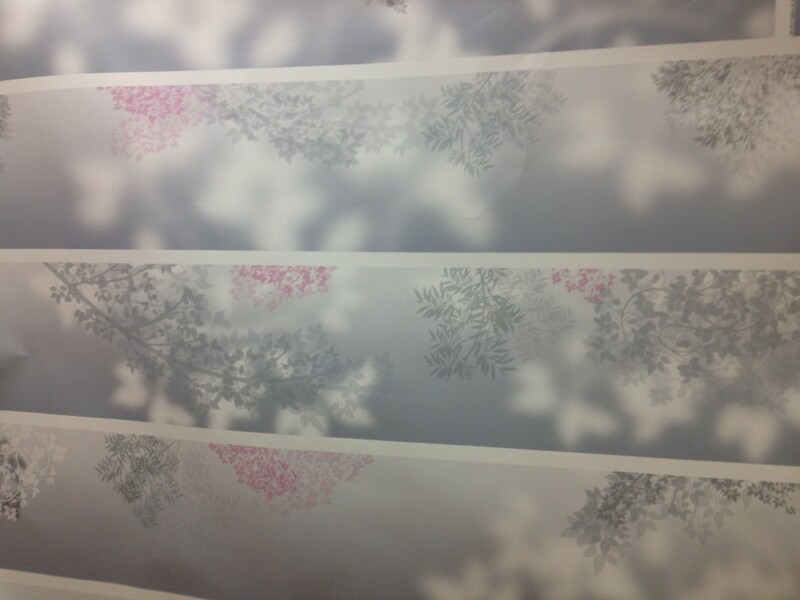 Digitally printed fabric in process of installation and attaching to frame. 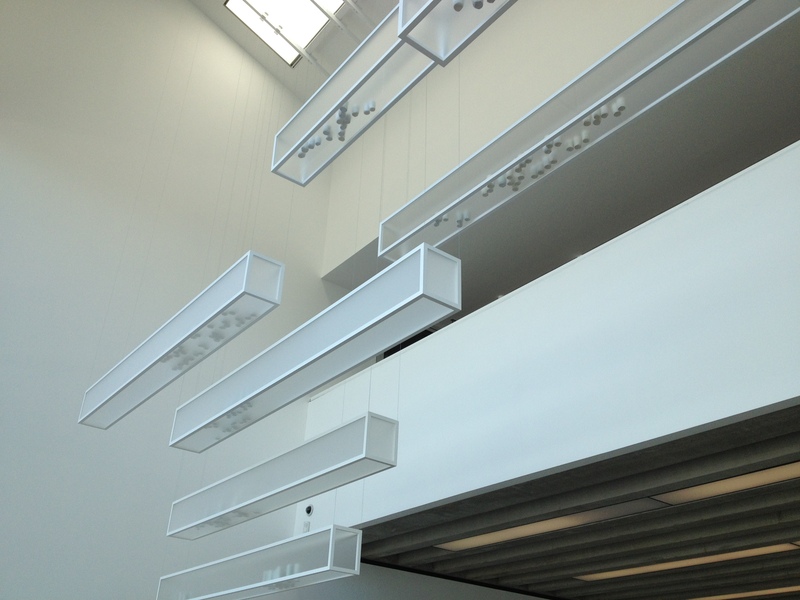 They show the fabric installation in progress and the steel frame attached the columns in the Central Concourse. 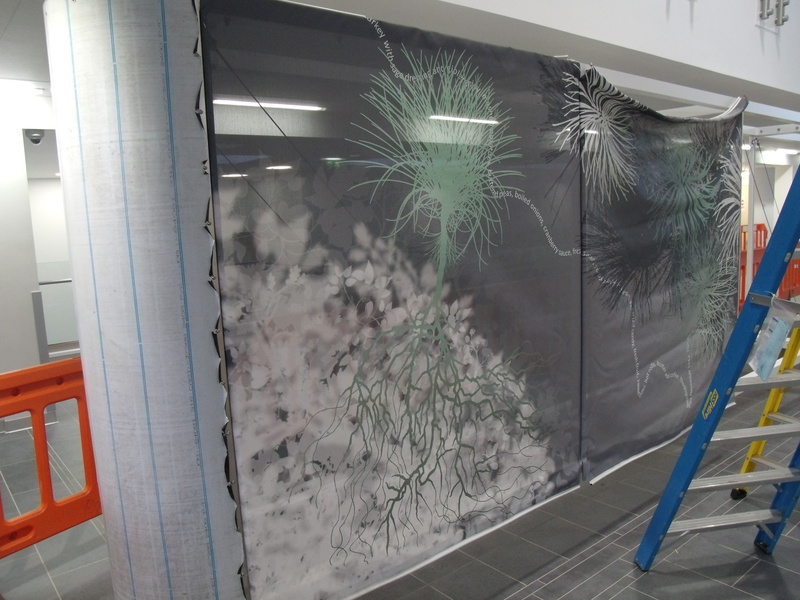 The concept for the work was determined by the need for the fabric to create a privacy screen between the main thoroughfare and hub of the Central Concourse & the clinical corridor which ran adjacent to it, without compromising the architectural space or blocking light. The tensile fabric is translucent and the supporting steel frame structure and architectural columns can be seen through it. 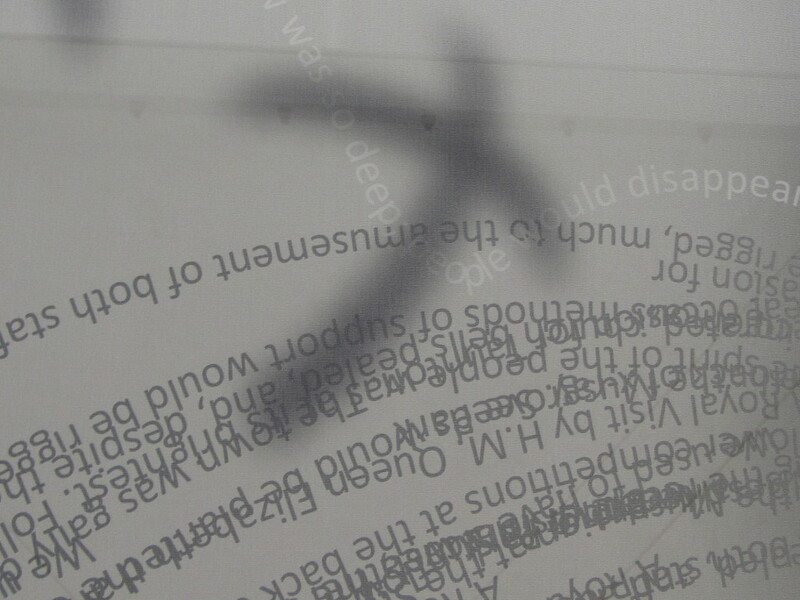 Detail: Shadow ‘Cross’ & dynamic flow of archive narrative . 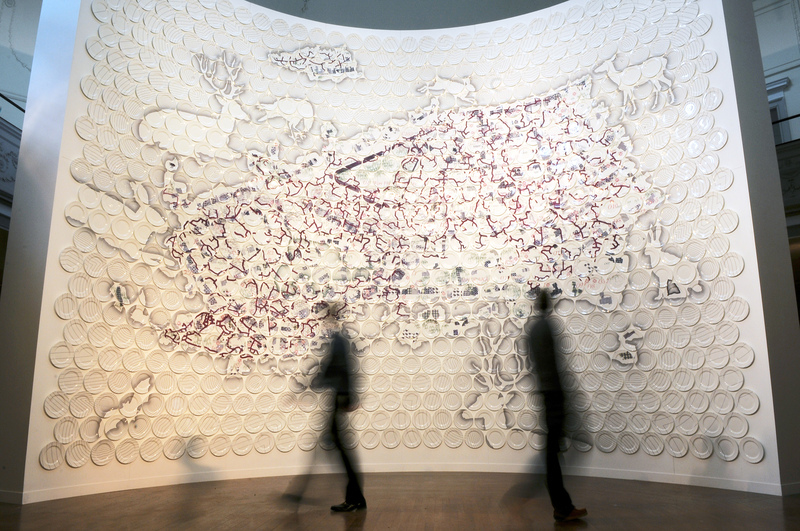 Text was used as both a textural device and a narrative with which to lead the viewer through the work. Text came from two primary sources. The Hospital provided a great archive through which to trawl. A good deal of this was in the form of written accounts of service by retired staff. The other source was form an ex US Servicemen, Sidney A. Smith MD, who had served as a doctor at Musgrove Park during WWII. His book, A History of Musgrove Military Hospital During World War II and The 67th General Hospital, was a fascinating account of the early years and origins of the Hospital. Sidney Smith had very kindly allowed me access to his photographs & images during my time working a lead artist at Musgrove Park. 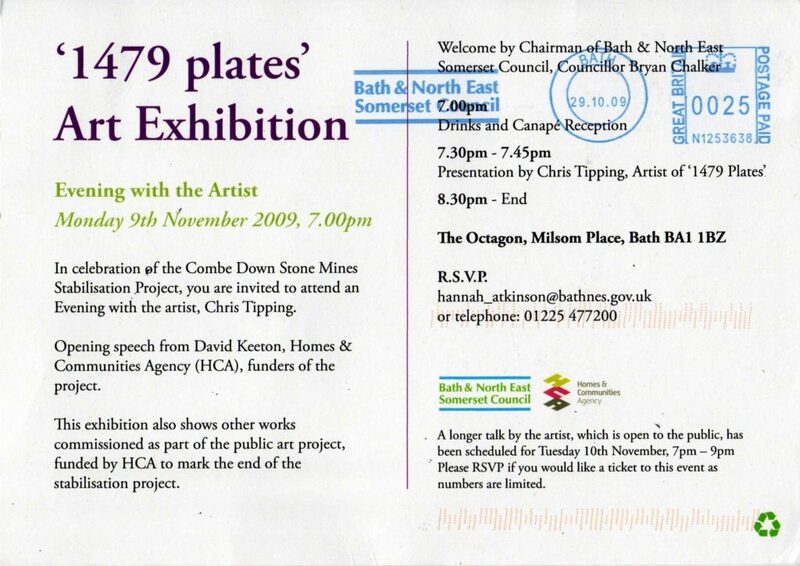 Some of this text is below: “A Royal Visit by H.M Queen Elizabeth the Queen Mother on Thursday, 19th November 1959, was a great occasion for Taunton. 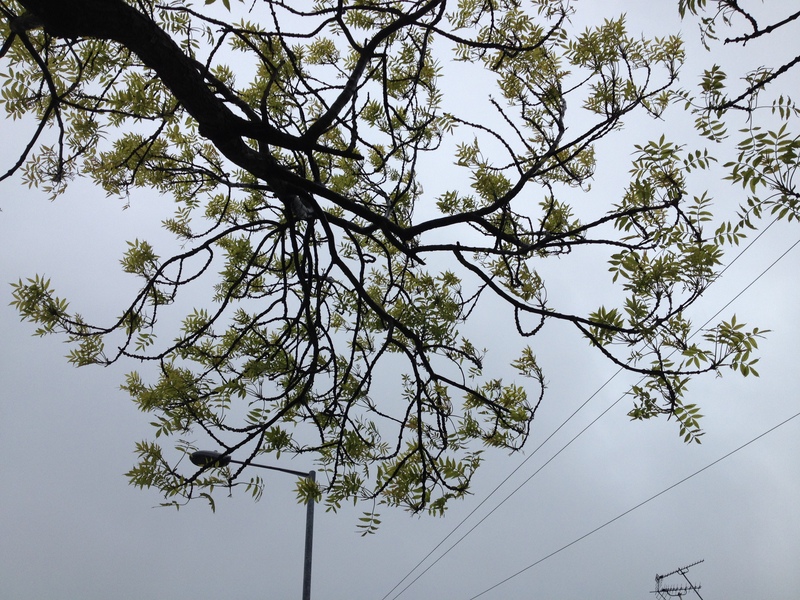 The town was gaily decorated, church bells pealed, and, despite the dismal weather forecast, the spirit of the people was at its brightest. Following the reception at the Station, H.M. Queen Elizabeth left for the Musgrove Park Branch of the Taunton & Somerset Hospital, where on arrival, she was presented with a posy of orchids, pink rosebuds and lilies of the valley”. “The 67th General Hospital adopted a banner, which bore images of a Pine tree and a cactus plant to symbolize the Maine contingent of doctors and nurses joined with the enlisted men who were mostly from Texas and Oklahoma”. “We used to have Sunflower competitions at the back of x-ray. Seeds would be planted and ingenious methods of support would be rigged, much to the amusement of both staff and patients”. “From the beginning of my time here we had the National Uniform, classic navy blue for the Sisters and light blue for the Staff Nurses and of course you had your belt, which kept many a waistline under control. We were quick to abandon the paper hats, although the sisters were more reluctant to lose their frilly hats and sleeves. Everyone knew who you were because of the uniform you wore”. The frame as seen from level one. 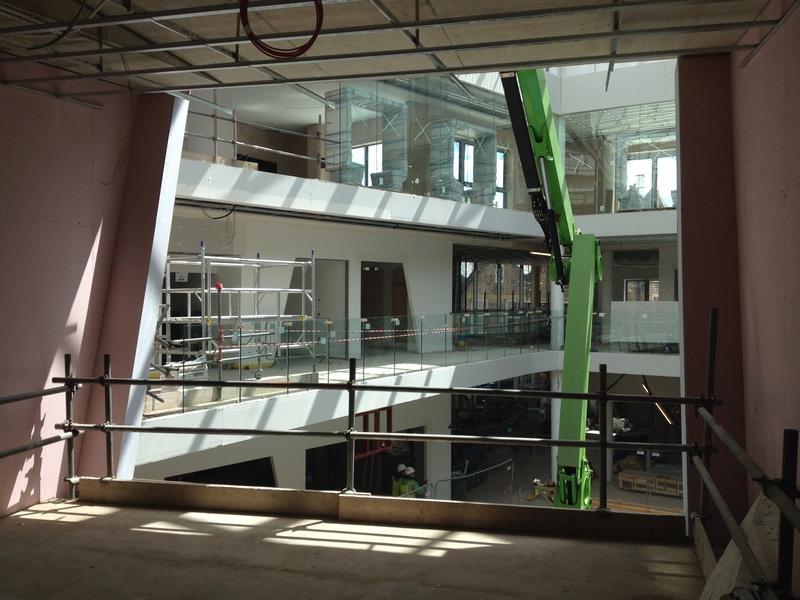 The tensile work fully installed, as seen from the Level 1 balcony. The right hand side of the Central Concourse will become a retail area with units running the same length as the screen opposite. They are just out of shot in this image. 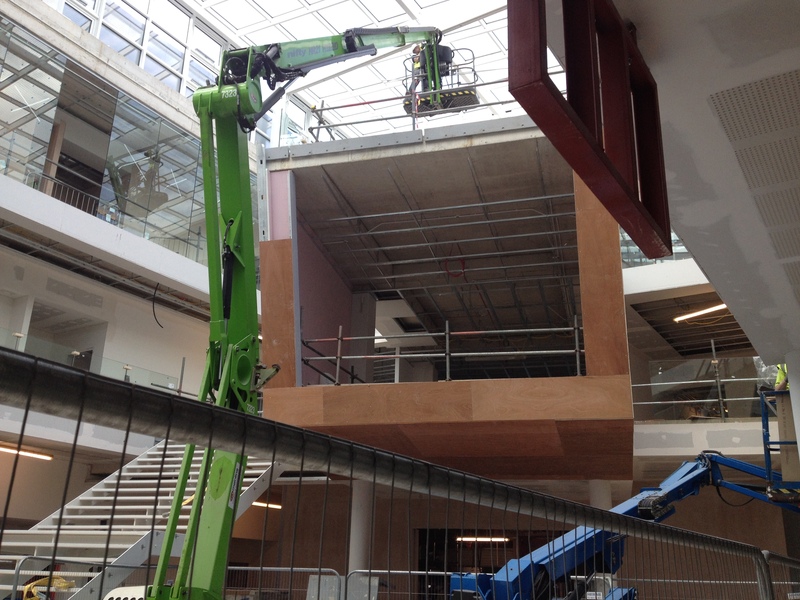 The Central Concourse space has a fantastic timber ceiling detail by Project Architects BDP. 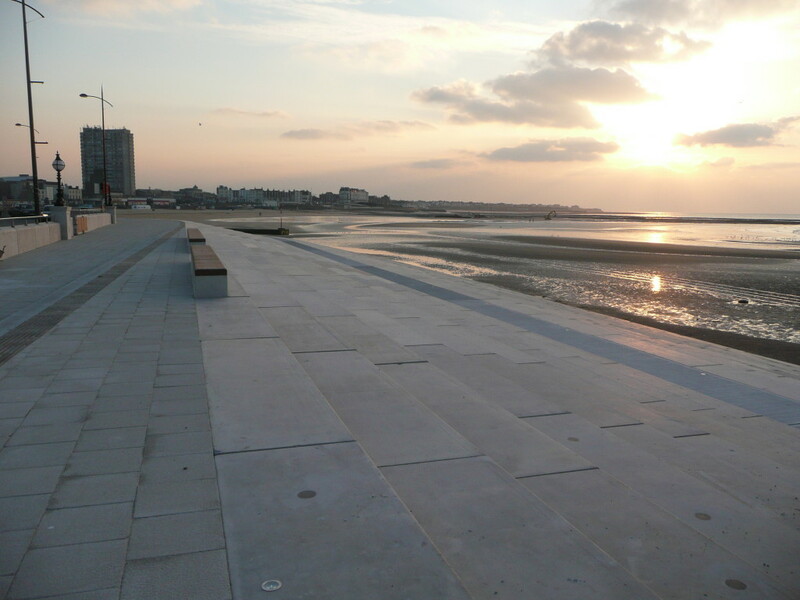 I travelled down to Southampton for a site visit to review the basalt kerbs installed along Blechynden Terrace. 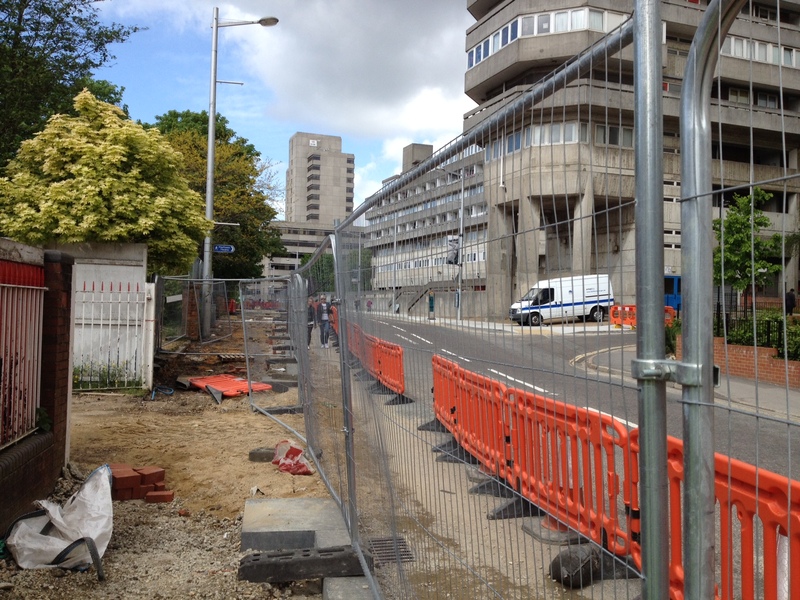 Looking East along Blechynden Terrace towards Central Station, with the Grade 2 listed Brutalist Wyndham Court on the right hand side. 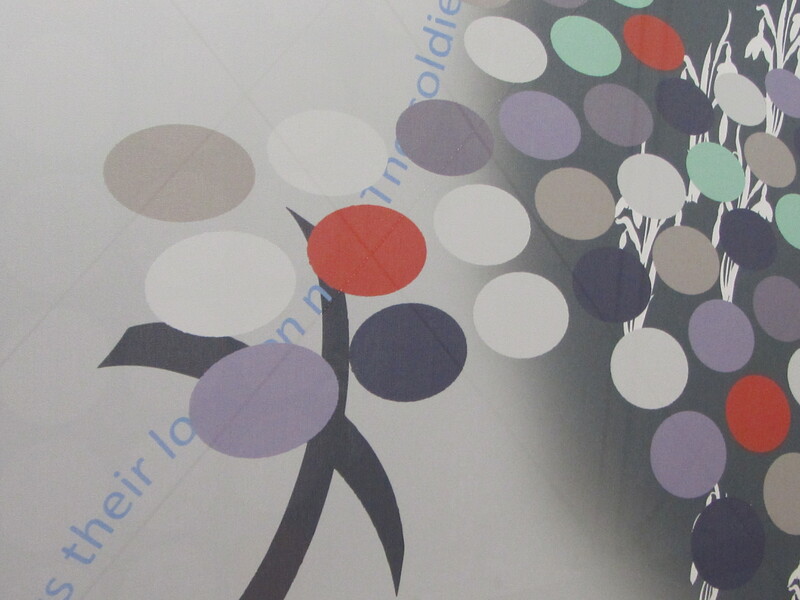 The kerbside artwork feature is 290 metres long & features an inset narrative relating to to specific events and places along the line. 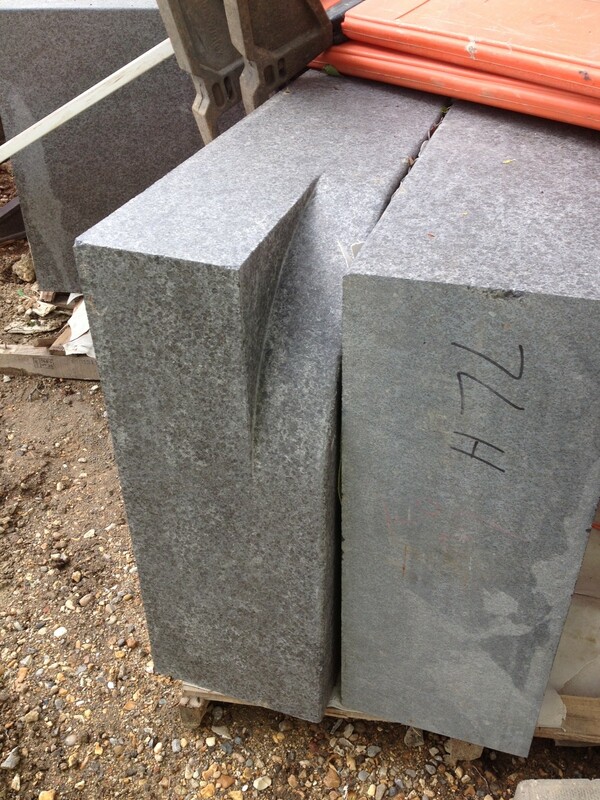 These robust blocks form the kerb edge to the ‘Canal Shore’ artwork currently in production by Hardscape up in Halifax. Some corner quadrant features have been installed. 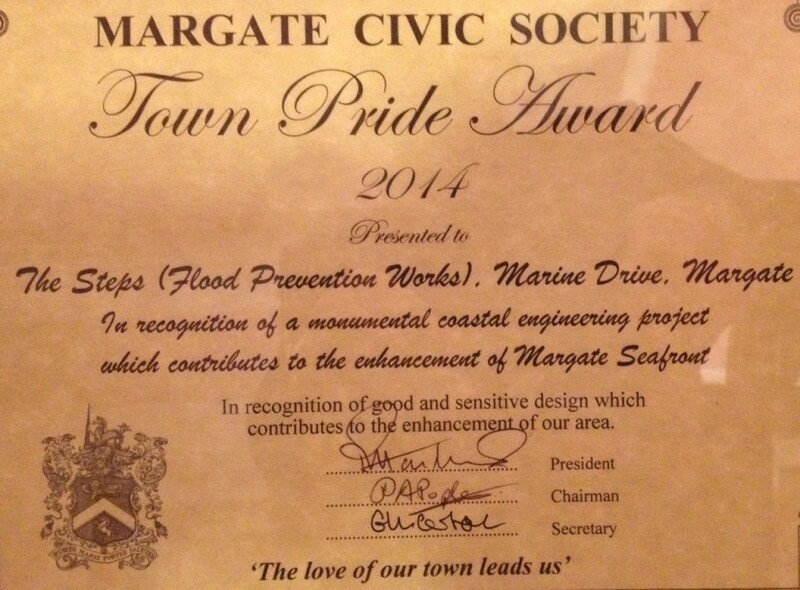 This feature runs from outside the Station Forecourt, to the bottom of West Park Rd and Kingsbridge Lane. 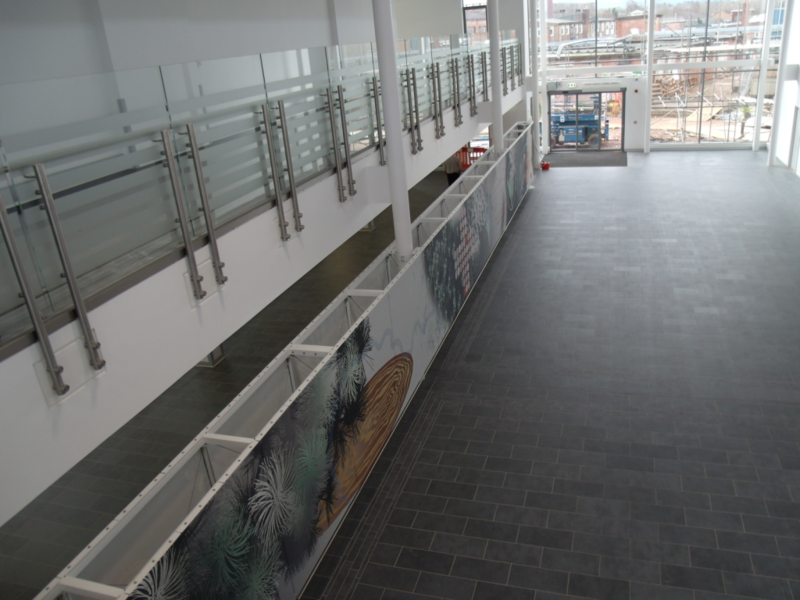 This text based work – the text is created via water jet cutting and inlaying a contrasting granite into the basalt – is 290 linear metres long x 795mm wide. 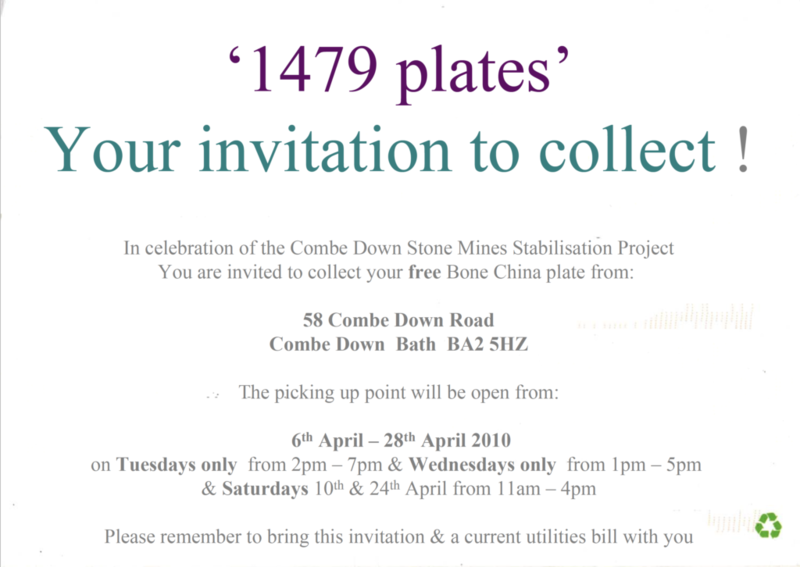 The text slabs have arrived on site, but awaiting installation in July. 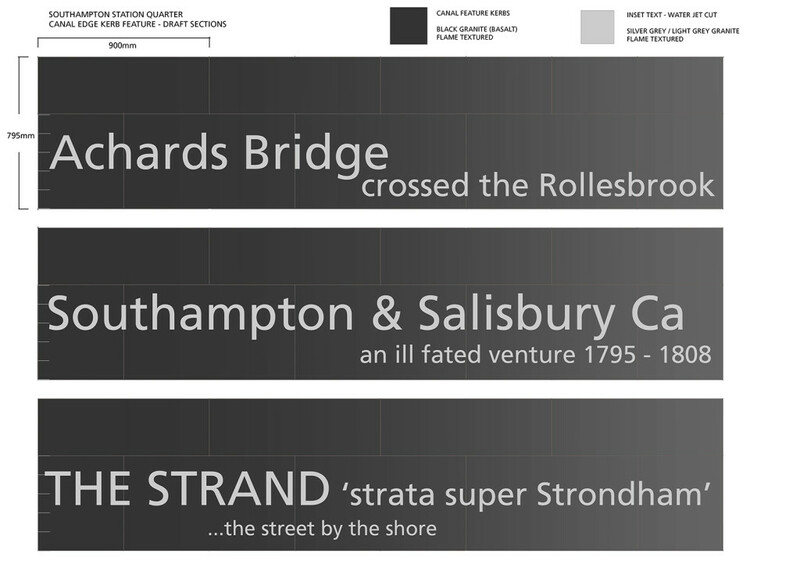 Draft artwork for part of the text feature ‘Canal Shore’. 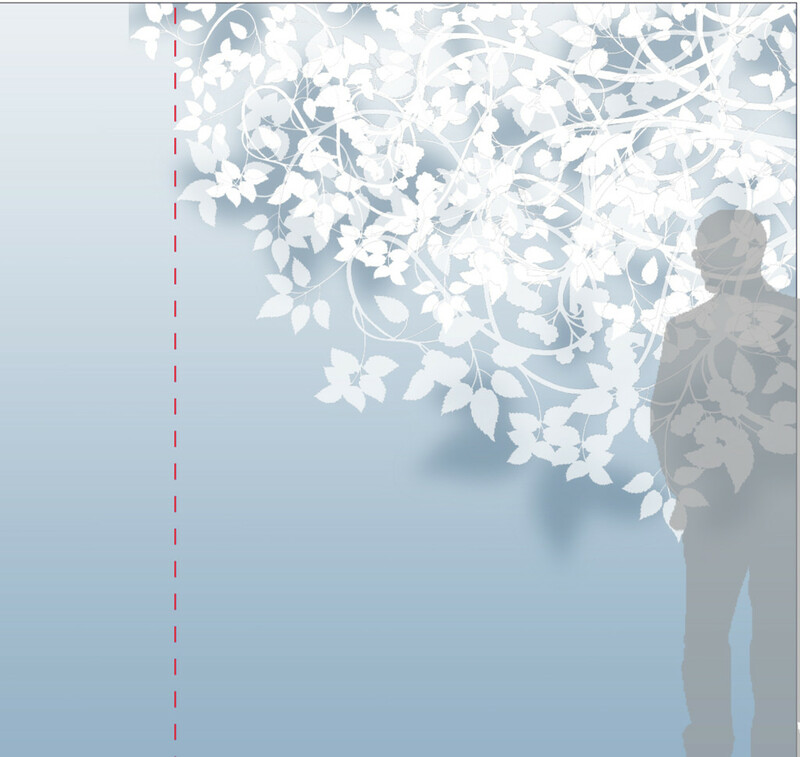 Draft Artwork of text for ‘Canal Shore’. Draft setting out of text for the ‘Canal Shore’ detail. 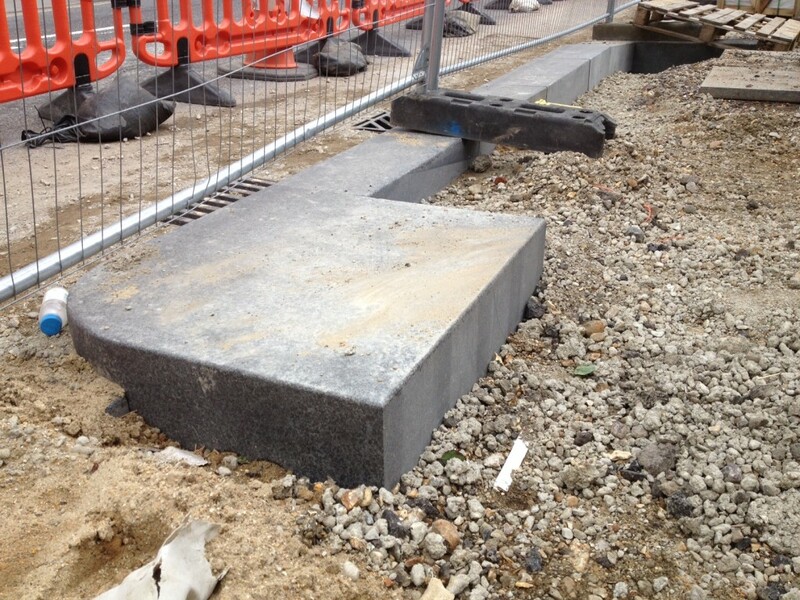 Robust basalt blocks from Hardscape on site awaiting installation as part of the kerbside feature ‘Canal Shore’. 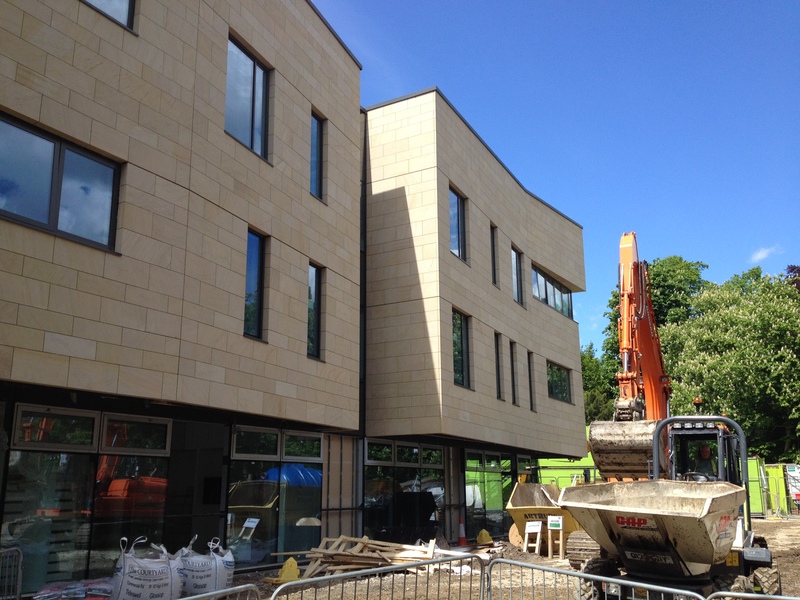 Large scale basalt quadrant blocks installed on site along Blechynden Terrace.